"Building on an emerging body of literature identifying connections between state policy and renewable energy, [State of the States 2010: The Role of Policy in Clean Energy Market Transformation] quantifies the connection between state clean energy policies, renewable energy development and actual reductions in energy use. Renewable energy use increased 3 percent across the United States in 2010, the report says." 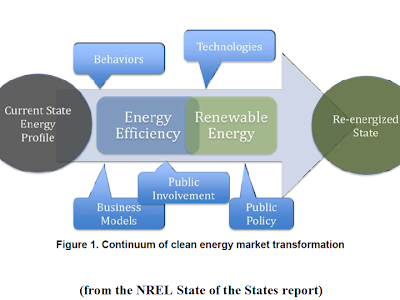 "To track the progress of the states and regions toward a clean energy economy, NREL also provided the analysis and findings for DOE’s 2009 U.S. State Clean Energy Data Book…Published in October 2010, [it] summarizes the status of state-level energy efficiency and renewable energy developments and supporting policy implementation…It identifies the states and regions leading in overall renewable energy capacity and energy efficiency policy [including]…"
"… In 2009, Maine had the largest percentage—23 percent—of non-hydro renewable generation, mostly from bioenergy… Texas leads the country in total non-hydro installed renewable energy capacity… California is the leader in solar energy installed capacity… Oregon, California, Illinois, Iowa, Maine, Montana, New Hampshire, and Pennsylvania have the strictest building codes, which require high efficiency in commercial and residential construction. "NREL provided the analysis for both the State of the States 2010 report and the U.S. State Clean Energy Data Book under its Clean Energy Policy Analyses [CEPA] project…"
"…[A new report] assesses climate change risks and how these risks could impact water operations, hydropower, flood control, and fish and wildlife in the western United States. 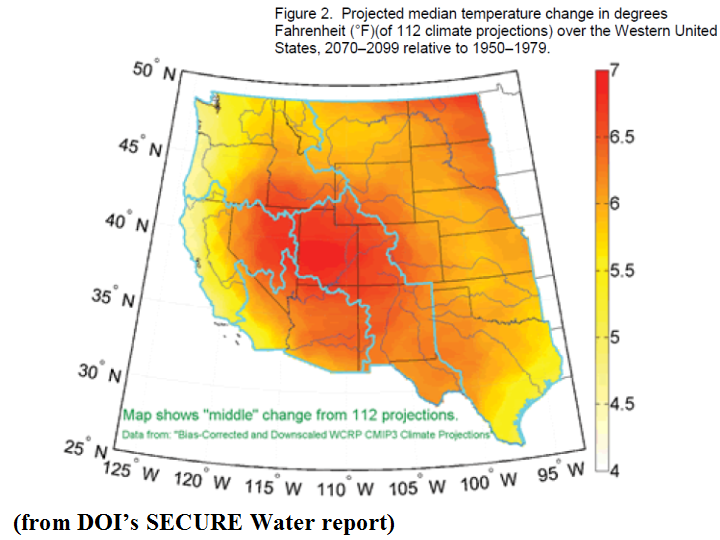 The report to Congress, prepared by [the Department of the] Interior’s Bureau of Reclamation, represents the first consistent and coordinated assessment of risks to future water supplies across eight major Reclamation river basins, including the Colorado, Rio Grande and Missouri river basins." 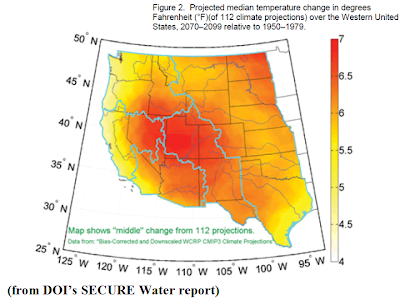 Reclamation; Managing water in the west responds to requirements under the SECURE Water Act of 2009…[It] shows several increased risks to western United States water resources during the 21st century…[including]…"
"…[P]rojected changes in temperature and precipitation are likely to impact the timing and quantity of stream flows in all western basins, which could impact water available to farms and cities, hydropower generation, fish and wildlife, and other uses such as recreation…Through the WaterSMART Basin Studies Program, Reclamation is developing and evaluating options [with stakeholders across the West] for [sustainably] meeting future water demands in river basins where water supply and demand imbalances exist or are projected." 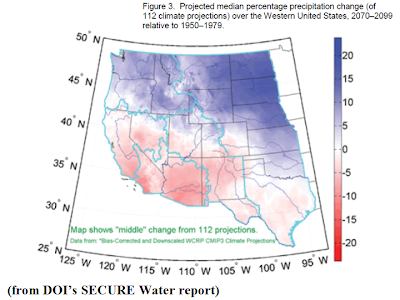 "The Bureau of Reclamation is the largest wholesaler of water in the country, providing water to more than 31 million people and to one out of five Western farmers for irrigation of more than 10 million acres of farmland. 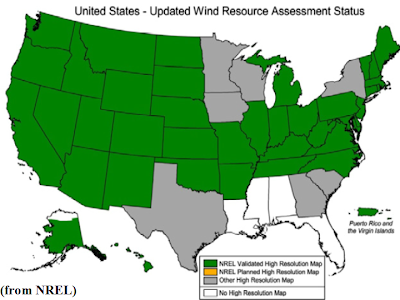 Reclamation is also the second largest producer of hydroelectric power in the western United States with 58 power plants generating nearly a billion dollars in power revenues and producing enough electricity to serve 3.5 million homes." 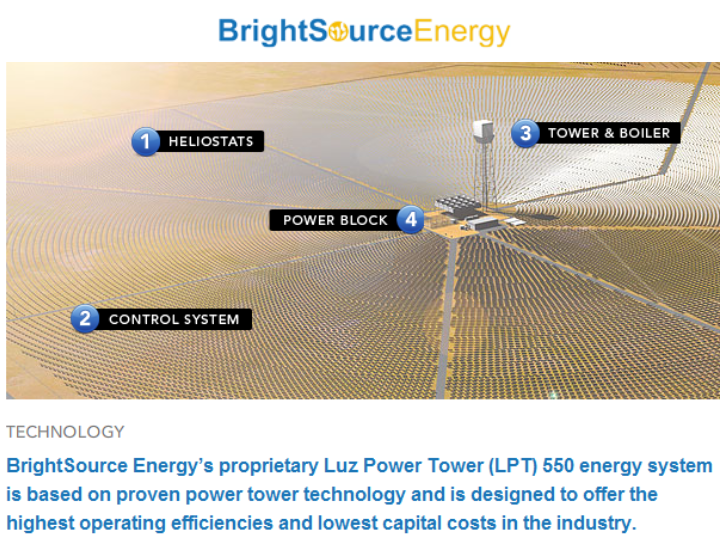 Size matters: The multi-project approach to installing CSP capacity; BrightSource Energy and the Solar Trust of America have made strong progress on securing funding and breaking ground. Is the multi tower/multi plant approach a blueprint for success? 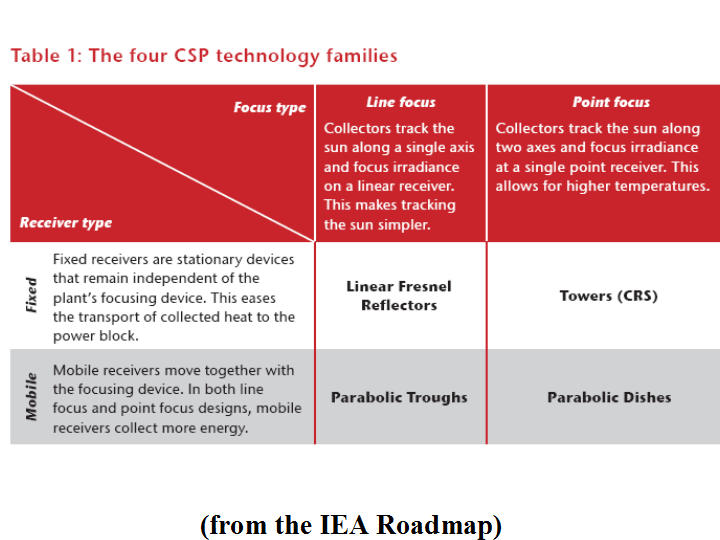 "…[This] is welcome news for the CSP industry and in particular for the multi-plant approach…[T]he Blythe project will generate more solar power than all other solar-concentrating projects in the world combined…[E]very MW of solar can power around 200 houses, and although some 508MW of power is already being produced and 399MW is actively under construction, a whopping 9,146MW ( including the Blythe project) is in development stages…"
"…The multi-plant approach can also [level the playing field when it comes to technology choice and efficiency by taking] advantage of the various technologies on offer. 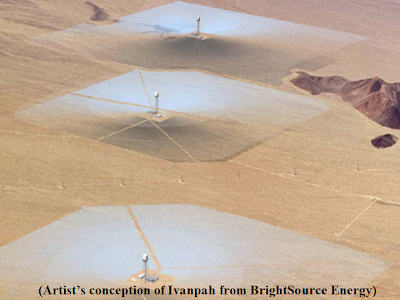 The Blythe project will use parabolic trough technology…The [BrightSource] Ivanpah multi-plant project currently under construction using a DoE loan of $1.4bn, is using towers which, according to developer Brightsource, offer the highest operating efficiencies and the lowest capital costs possible due to commodity-based inputs, no concrete foundations, fewer pipes and cabling and less water usage…"
"There has also been a broad plunge in prices for energy as competing alternative power sources gain ground, notably Photovoltaic (PV)…[which is simpler to get off the ground and into the] production stage, which drives prices down…Despite the promising progress made by both the Blythe and Ivanpah projects, two major CSP projects (Calico Solar and Imperial Valley) by Tessera were recently sold off…after finance could not be secured and a power purchase agreement (PPA) fell through. 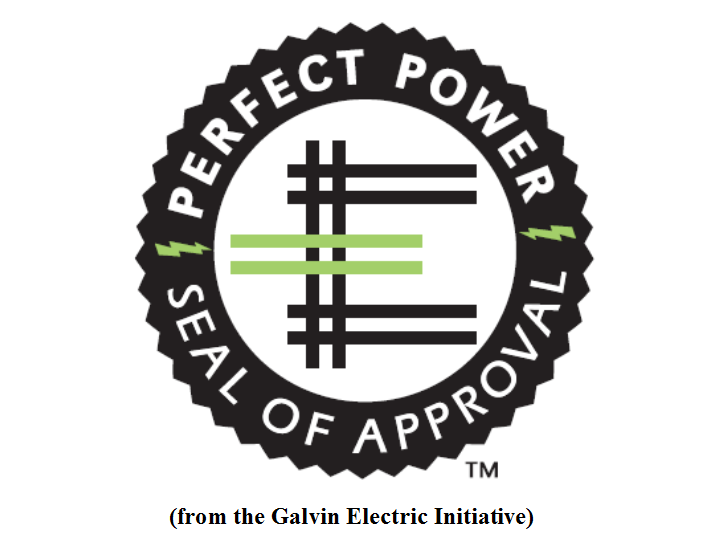 Their new developers are now likely to use PV…"
"The Galvin Electricity Initiative…introduced the Perfect Power Seal of Approval™ (PPSoA), a program to drive innovation in the electric power industry by embracing consumer needs. The program, modeled after the U.S. Green Building Council’s LEED certification for buildings, will evaluate and recognize the nation’s top-performing smart microgrid projects in key performance categories. 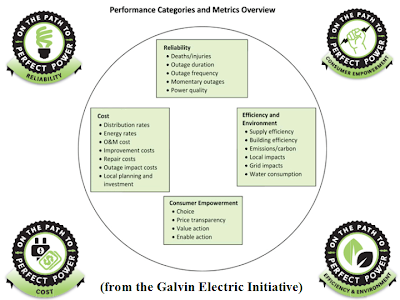 "…[The PPSoA], which is based on Six Sigma quality methods, will help the industry identify necessary improvements as well as strategies for achieving more aggressive goals that meet or exceed consumer demands — financed, for example, by eliminating wasted energy. 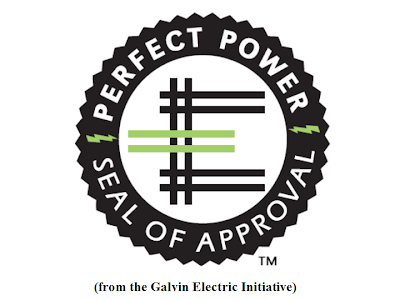 Projects that score well in one or more categories will be awarded a category-specific seal…recognizing exemplary performance…Projects that excel in all four categories will be awarded the full Perfect Power Seal of Approval." 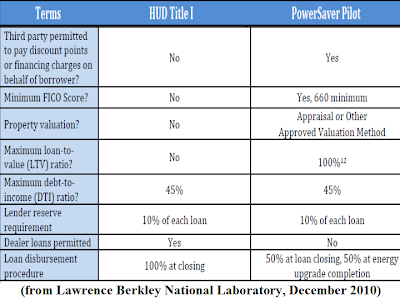 "…The Initiative is collaborating with consumer protection certification organization Underwriters Laboratories, Inc. (UL), to train and certify PPSoA evaluators…In the pilot phase, the PPSoA program will test the beta version of the rating system by evaluating a select group of projects. 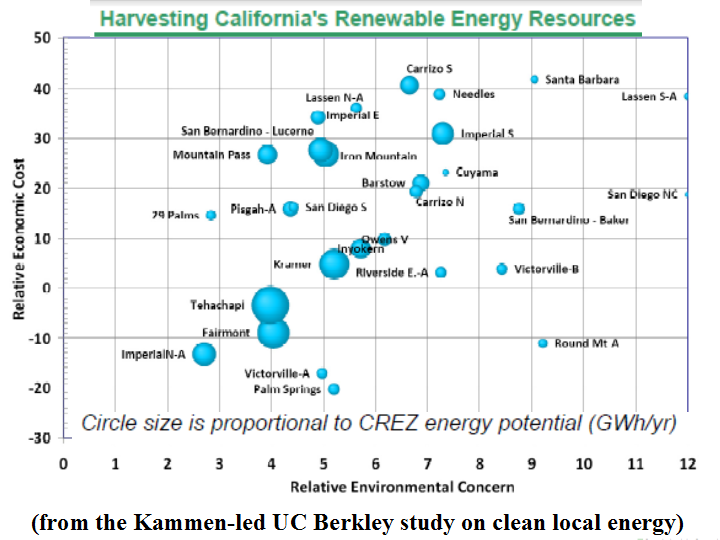 Beyond the pilot phase, the program will expand to additional types of projects…"
"A broad partnership of business, community, and environmental groups has come together to accelerate the development of California’s clean energy economy. 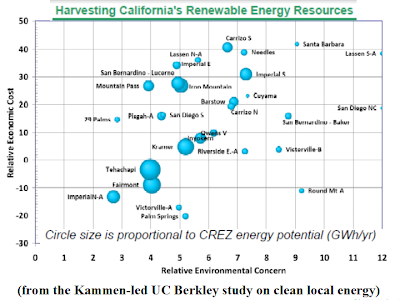 "The Clean Coalition, a nonprofit clean energy policy organization based in Palo Alto…[ launched] the CLEAN California Campaign…[It will promote] policies to meet Governor Jerry Brown’s call to install 12,000 megawatts of new renewable energy projects in California communities by 2020. The Campaign’s initiatives will maximize clean energy job creation, attract billions of private investment dollars, boost state and local government budgets, and reduce electric bills." "The Campaign will achieve Governor Brown’s energy target by making it easier to sell clean local energy to utilities and connect these projects to the grid. 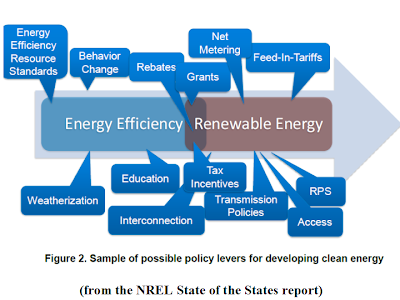 The Clean Coalition is leading the Campaign's legislative and regulatory initiatives: (1) to require standard, long-term CLEAN Contracts for utilities to purchase energy from new projects; and (2) to make grid interconnection costs and timeframes reasonable and predictable…"
"…The US Department of Energy’s National Renewable Energy Lab (NREL) estimated that CLEAN Programs are responsible for 45 percent of all wind energy and 75 percent of all solar photovoltaic capacity installed before 2008. 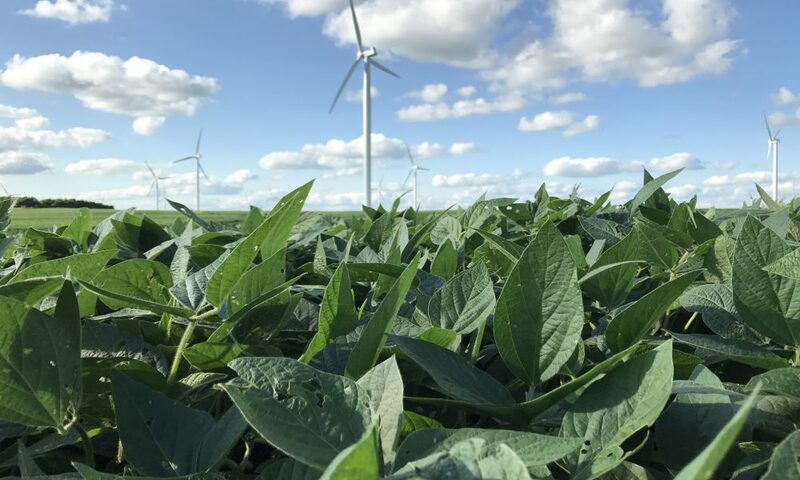 Currently, roughly 90 percent of the solar and the vast majority of biopower and wind capacity deployed in the world are driven by CLEAN Programs." Because communication is the lifeblood of a relationship, it is obvious why the relationship between the U.S. and its New Energy is having so much trouble getting established. There is enough proposed wind capacity not being built due to a lack of transmission to provide a third of U.S. electricity. Development of entirely viable solar power plants and geothermal projects is stalled at sites rich with potential because there are no wires to deliver the power to where it can be consumed. Where there already is built generation, transmission system operators are curtailing supplies because their grids cannot manage the capacity. 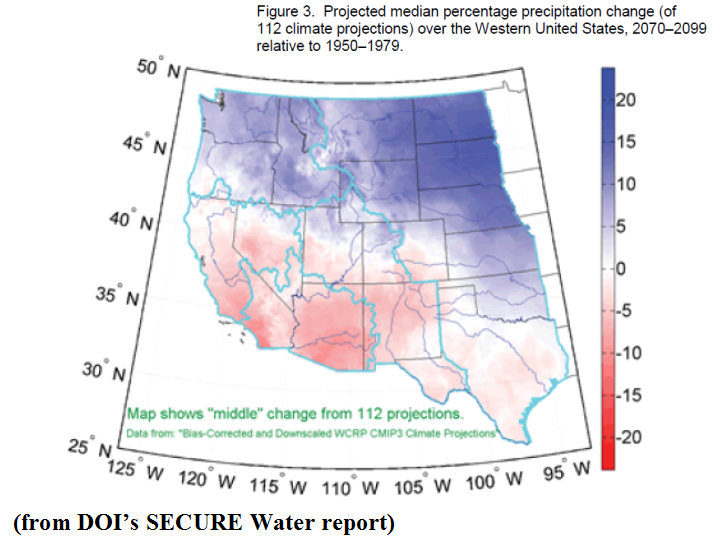 In the Pacific Northwest and California, melting winter snow packs are expected this spring to force megawatts of wind off the inadequate wires with overwhelming output from hydroelectric dams. In short, New Energy and the U.S. aren't communicating. Their romance, so rife with possibility, is floundering. 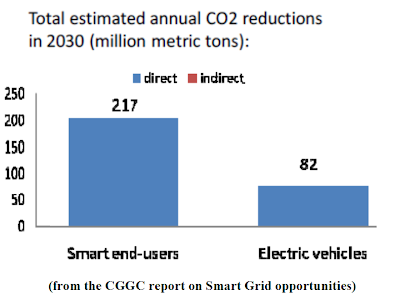 Greenhouse gas emissions continue to be a serious concern, billions in benefits from a New Energy economy are going unrealized and, as the study highlighted below shows clearly, the financial opportunities that would come from building new, smart, high capacity transmission are huge. The business adage that it is necessary to spend money to make money has rarely been so relevant. The adage prescribing communication to nurture a relationship could not be truer of the nation and its abundant New Energy assets. A half-century ago, the average home often had no more than a handful of electric appliances and gadgets. An electricity delivery system built to 19th century standards and capacities was then, perhaps, serviceable. Today’s home typically has dozens of electronic devices, tools, entertainments and necessities. It is time for this nation to build a smart, high-capacity, 21st century transmission system facilitating communication with its rich but geographically undesireable New Energy riches. It will benefit every region and sector of the economy to do so. It could also be the beginning of a beautiful relationship. The smart grid is often referred to as an “energy internet”—a decentralized system that turns the electric power infrastructure into a two-way network. This smart system allows utilities and customers to share information in real time so they can more effectively manage electricity use. 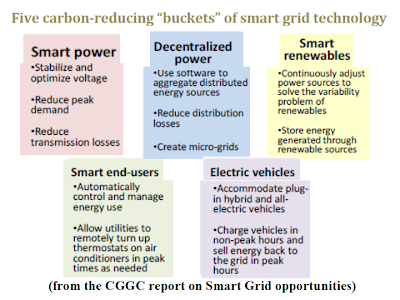 The Pacific Northwest National Laboratory (PNNL) estimates that a fully deployed smart grid could reduce the U.S. electricity sector’s energy and emissions by 12% in 2030.1 Even greater savings would accrue from tapping the smart grid as an enabler of clean energy sources. If accompanied by substantial support for decentralized power, renewable power, and electric vehicles, smart grid could reduce energy and emissions by an estimated 525 million metric tons, or 18% of the total from the electric sector (PNNL, 2010). The United States is among the global leaders in smart grid development, which is expected to create tens of thousands of jobs annually in coming years. 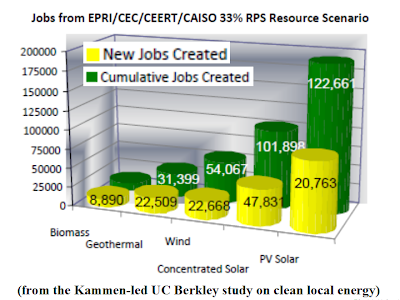 Previous research suggests that for each $1 million in investment, a range of 4.3 to 8.9 direct and indirect jobs will be created…For example, global energy consulting firm KEMA, using the low end of this range, estimated that 278, 600 U.S. smart grid jobs will be created by 2012, including jobs with utilities, contractors, and suppliers (KEMA, 2009). 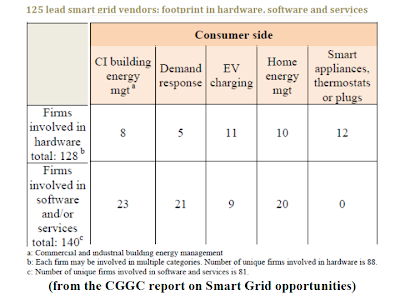 In this report, we focus on the subset of these jobs represented by the broad array of supplier firms involved, including those that have traditionally provided electric equipment and those that provide information technology (IT), core communications, smart hardware, energy services, energy management, telecom service, and system integration. 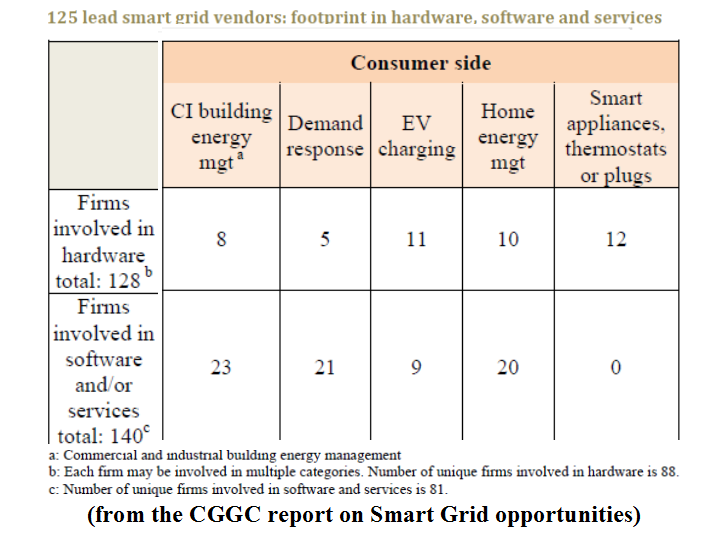 We examine 125 leading smart grid firms in order to help assess their potential role in creating jobs. 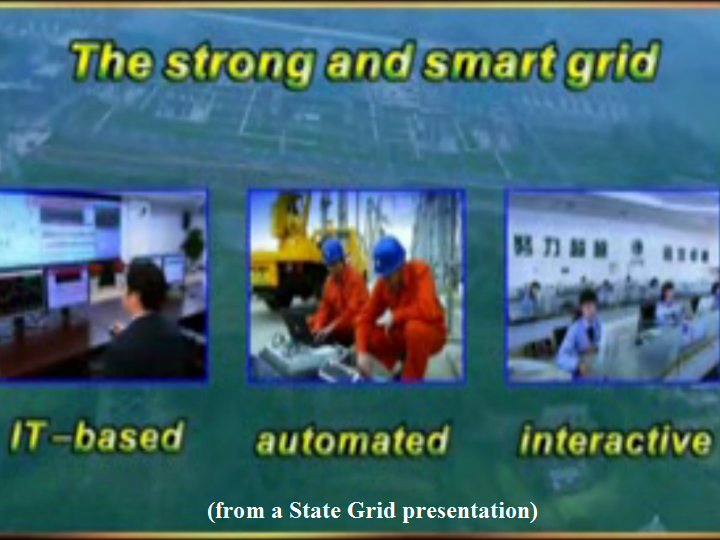 These lead firms provide hardware, software and services, which we divide into nine broad categories of smart grid technologies. Where possible, we identify what hardware, software and services each firm provides, and in which U.S. locations the relevant manufacturing and product development occurs. 2) Smart grid provides a way for well-established firms to transition from traditional products into new areas, including new manufacturing opportunities. For decades, a number of U.S. firms provided equipment for the power industry, but performed the manufacturing increasingly outside the United States. Many of these firms are now transforming from a device-only focus to new products including software, smart controls, and communications. These new activities are largely performed domestically. 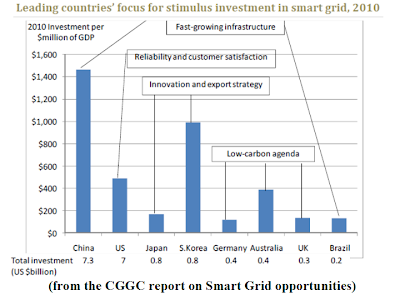 3) The fast-growing global market for smart grid technologies presents valuable export opportunities to be tapped by U.S. firms, large and small. 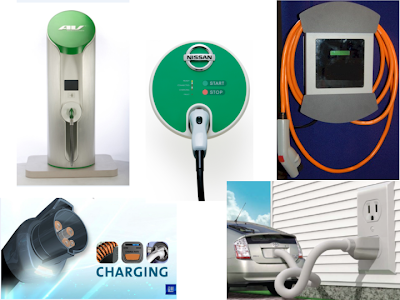 Smart grid, renewable energy, and electric vehicles are counted among the most promising sectors for increasing exports in the National Export Initiative—the federal government’s goal, announced in 2010, of doubling the nation’s exports in five years (U.S. DOC, 2010). 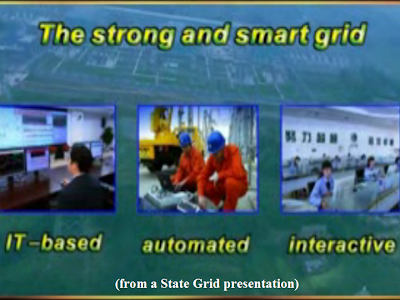 Industry leaders such as Cisco, GE, Hewlett Packard, and IBM are moving quickly to establish a stake in China’s smart grid market (Zpryme, 2010). Much smaller U.S. firms have also won large contracts in China and throughout Europe. 4) Future U.S. job creation by product vendors will likely concentrate in high-value IT innovations, product development, and systems design and engineering. 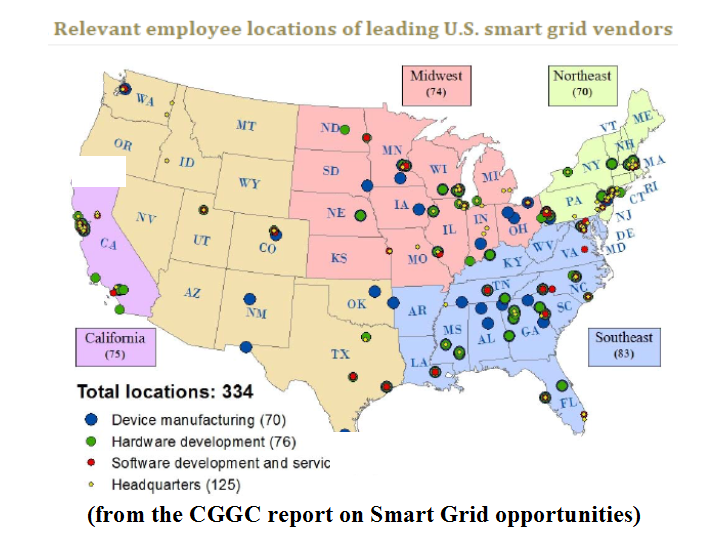 Many of the world’s leading smart grid vendor firms—including leaders in IT, core communications, energy management, telecom service, and system integration—are either headquartered in the United States or have an extensive U.S. presence. A number of large and small U.S. firms are also pursuing breakthrough innovations in hardware— specially those associated with renewable power, energy storage, or electric vehicles. These activities are often performed in domestic facilities to protect intellectual property. 5) Others are catching up quickly, so the United States will need to continue emphasizing not just innovation but also supportive policies. Chinese, Korean, Japanese, and Indian firms have reached U.S. levels or surpassed them in selected innovative technologies, such as high-voltage transmission (Berst, 2011b). Perhaps more important, several countries’ smart grid goals reflect energy policies that are not currently emphasized in the United States, including aggressive targets for renewable energy. 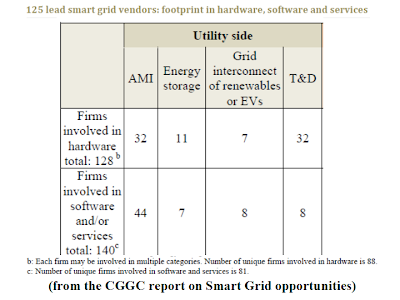 Similarly ambitious targets in the United States would increase demand for U.S. smart grid firms’ products and encourage investment in related clean tech innovations. 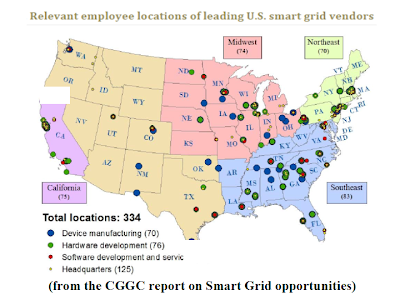 6) Regardless of where smart grid products are made, many additional U.S. smart grid jobs will be located in the service territories of participating utilities, which means they cannot be off-shored. These will include jobs not covered in this study, such as direct employment with utilities, contractors, and temporary field offices, engaged in performing construction, installation, maintenance and ongoing services. By definition, these will be local jobs. To make the most of job opportunities, it will be important for the United States to continue to pursue the cutting edge of smart grid technologies, including those needed for integrating renewables, decentralized sources and electric vehicles into the grid. Collaborations between public and private organizations can play a key catalyzing role. Concentrated local and regional efforts can leverage important partnerships in which R&D is directly connected to new product development, commercialization, new business incubation, and workforce development. 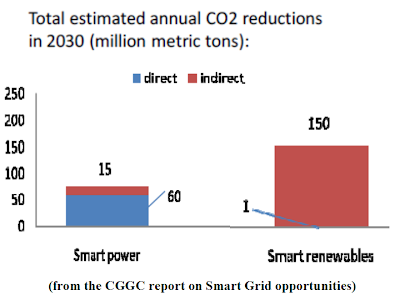 Such efforts are needed if the smart grid is to deliver on its considerable promise to reduce CO2, stimulate technology innovation, and create jobs. 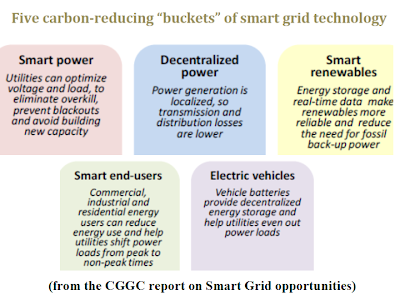 A smarter grid offers a cleaner, more efficient way to address the problem of peak demand. Providing peak-hour electricity requires grid operators to use expensive “peaker” plants that sit idle most of the year and require fuel bought on the volatile “spot” market. A truly smart grid would use digital technology to help utilities and customers manage existing resources more efficiently, thus reducing reliance on peaker plants and costly capacity expansions. Perhaps even more important over the long term is the smart grid’s crucial role as “enabler,” facilitating the economy’s much-needed transition to clean energy. 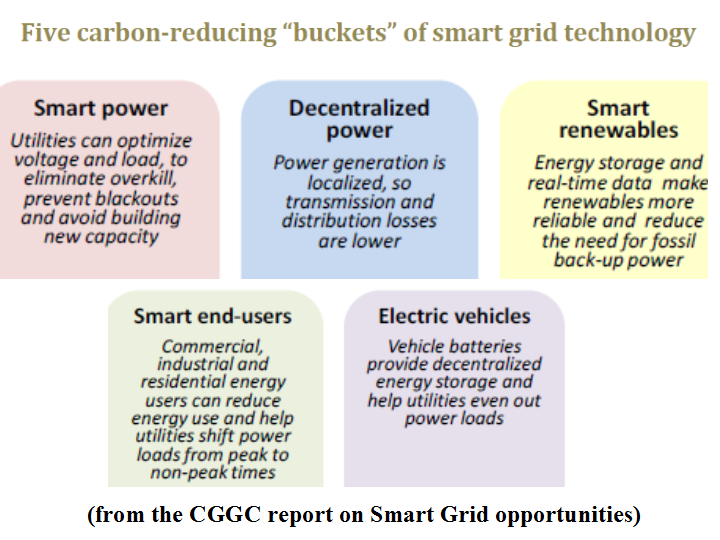 Analysts have noted that the smart grid holds the key to bringing renewable energy options to scale, making them more reliable and affordable (Leeds, 2009a). 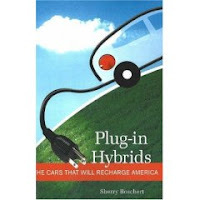 In addition, as the automotive industry makes its expected shift to electric vehicles in the coming decades, a smart grid will be needed to meet the challenge of charging millions of plug-in hybrid and all-electric vehicles. 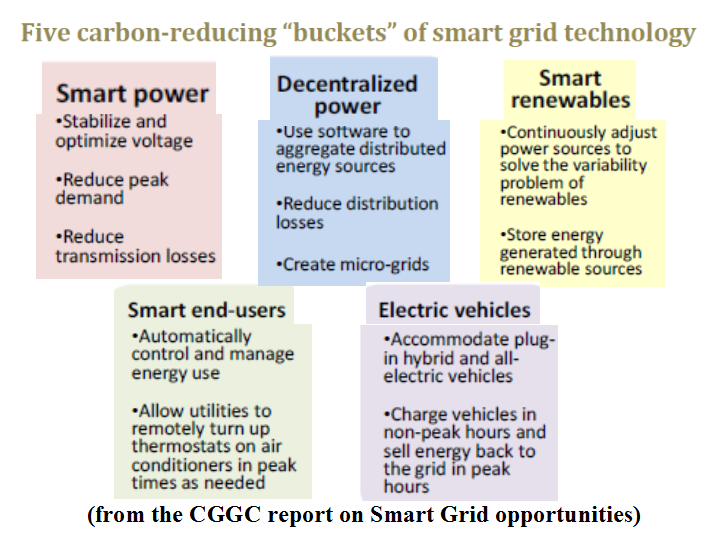 Our analysis is structured as follows: First we will give an overview of the most important carbon-reducing functions of the smart grid. 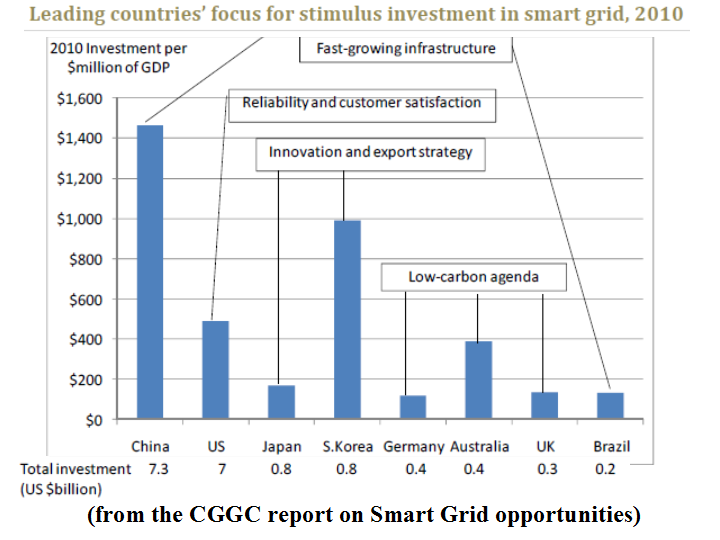 Next we will briefly describe the state of global smart grid development, placing the United States’ trajectory in the context of other leading countries. 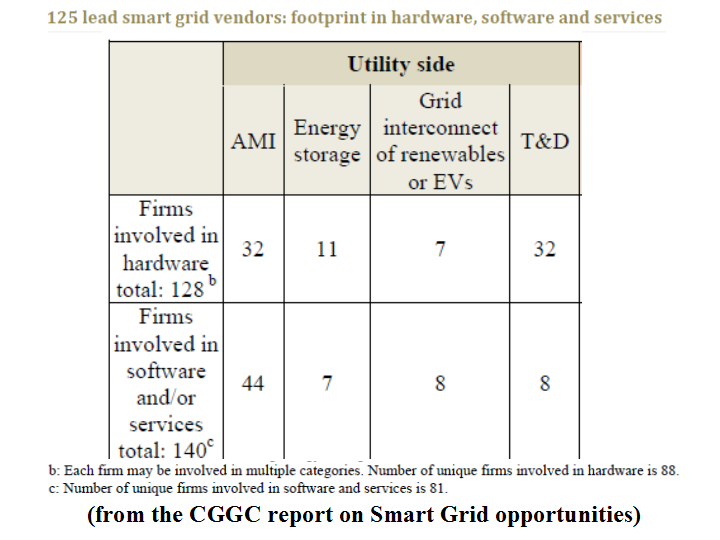 Then we will map out the U.S. value chain for smart grid hardware, software and services, drawing upon the extensive contribution made in recent studies by the Cleantech Group (Neichin & Cheng, 2010) and Greentech Media Research (Leeds, 2009a). Finally, we will discuss the types of U.S. jobs involved, where they will likely be located, and what workforce development will be needed in order to fully tap the carbon-reducing benefits of the smart grid. Smart grid efforts are well underway in the United States and abroad, with leading countries spending billions of dollars annually in public and private investment. Much of this activity is focused on reducing peak power demand and making an outdated electric system more reliable. 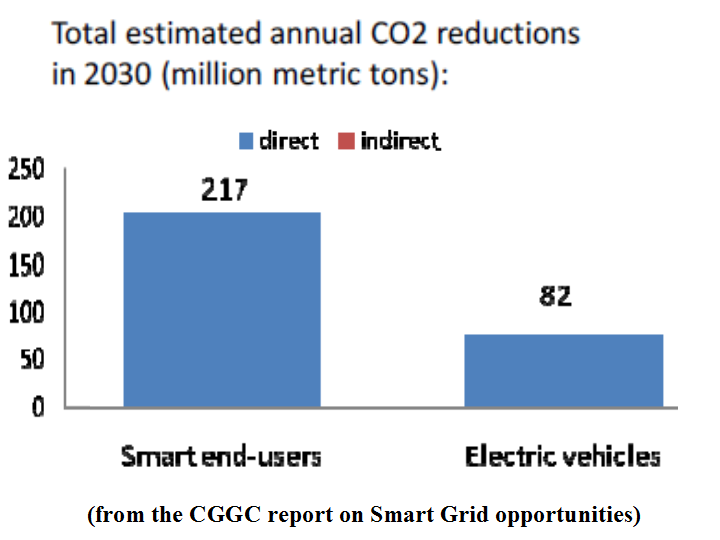 Yet even greater energy- and carbon-saving potential lies in harnessing the smart grid to deploy distributed generation, renewable energy and electric vehicles. Fully tapping these resources will not happen automatically with smart grid development, but will require targeted policy support. It will also require regulatory reform and, more important, fundamental changes in the electricity sector’s prevailing business model, which incentivizes utilities to sell more, not less energy. 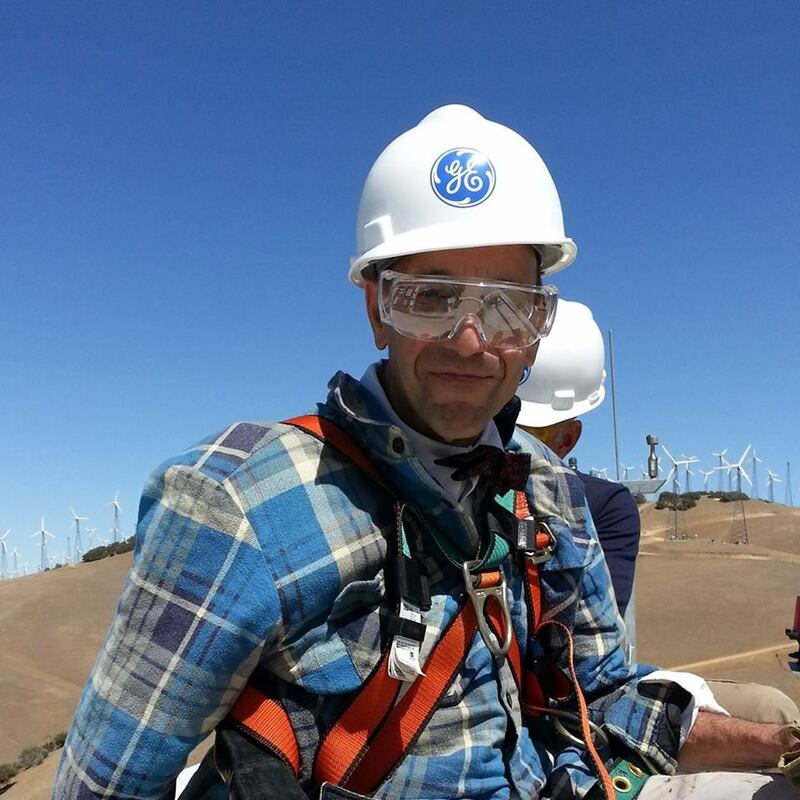 The smart grid promises a considerable role for U.S. jobs. Many of the positions necessary to install, maintain, and repair the new technologies are tied to utilities’ local service territories and so cannot be outsourced. In addition, many of the world’s leading smart grid vendor firms—including global leaders in IT, core communications, energy management and services, telecom service, and system integration—are headquartered in the United States or have a large U.S. presence. Their U.S. job locations will likely emphasize product development, software and services. New manufacturing opportunities may be largest in assembly and integration of smart devices, and in production by new firms that specialize in emerging clean technologies for renewables, energy storage and electric vehicles. To make the most of job opportunities, it will be important to actively pursue the cutting edge of smart grid technology. Collaborations between public and private organizations can play a key catalyzing role. Concentrated local and regional efforts such as those in Austin, TX can leverage important partnerships in which R&D is directly connected to new product development, commercialization, new business incubation and workforce development. Such efforts are needed if the smart grid is to deliver on its considerable promise to reduce CO2, stimulate technology innovation and create jobs. 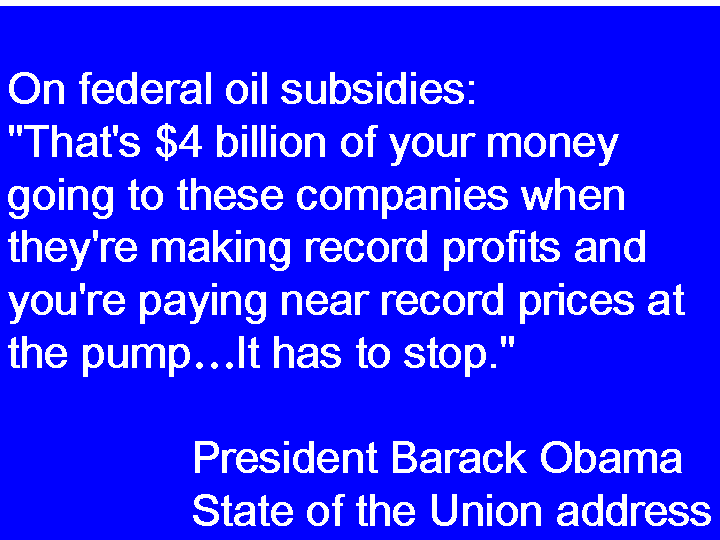 "Rising gasoline prices are expected to be a crucial factor in next year's presidential election, and Obama has ramped up his public statements on the issue…[He recently announced] a Department of Justice working group that will probe oil price fraud and speculation…The oil and gas industry's billions in tax subsidies were also singled out for criticism during [his] State of the Union address…"
"The Republican budget plan, aimed at dramatically reducing the country's $14 trillion deficit, calls for steep cuts in transportation and energy, including slashing by 70 percent a Department of Energy loan guarantee program that supports renewable energy like wind farms and solar installations." "Nebraska Senator Mike Johanns, in his Republican rebuttal to Obama's address, said the idea that government policies could create job growth ‘misses the point entirely’…[because job creation] ‘starts with our businesses, especially our small businesses’…"
BrightSource Files for $250M IPO: A Closer Look; Another greentech IPO aspirant with massive VC and DOE loan funding, negligible sales, big losses, and uncertain costs. And beware the desert tortoise, my son, the jaws that bite, the claws that catch. "BrightSource Energy just filed for a $250 million initial public offering…The big question is: Do public markets and institutional investors have the stomach for a low-revenue, non-profitable, capital intensive energy firm with a technology unproven at scale -- plus, a tortoise problem? 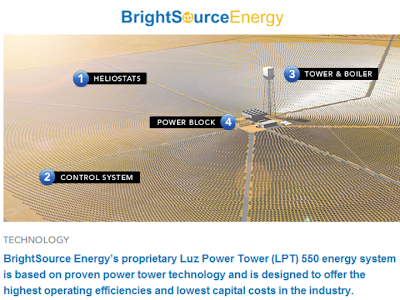 "…BrightSource (BSE) is a utility-scale solar thermal player with massive funding from private equity sources and U.S. DOE loan guarantees…[It uses] an air-cooled 'power tower' architecture in which vast arrays of mirrors or 'heliostats' focus sunlight at a central elevated boiler, producing steam and powering a turbine." "Late last month Alstom, the French power plant firm, invested $201 million into BrightSource -- bringing the firm's total VC funding to $530 million…Separately, BrightSource has secured substantial sums for their flagship Ivanpah project…With a total project cost of $2,180 million, the US DOE Loan Guarantee program is to provide loans worth $1.6 billion, NRG has committed up to $300 million in equity, and earlier this month Google committed $168 million…The balance will be contributed by BSE and Bechtel. "BrightSource has signed 14 power purchase agreements (PPAs) to deliver approximately 2.6 gigawatts of installed capacity to two of the largest electric utilities in the U.S., PG&E, and Southern California Edison…[estimated] as $4 billion of revenue opportunity…Ivanpah is the first project…[It] will have a gross installed capacity of 392 megawatts and a net output of 370 megawatts…"
"According to the S-1, VantagePoint Venture Partners is the majority controlling interest in Brightsource. VantagePoint holds 24.9 percent of BrightSource’s stock, Alstom has a 17.8 percent share, Morgan Stanley has a 10.5 percent share, and Draper Fisher Jurvetson owns 6.7 percent of the company. The company has had five funding rounds…[It also has environmental challenges]…[unspecified PPA pricing]…[and a protential transmission access obstacle]… So, should you invest your nest egg in BrightSource shares?" "Eighteen regional and national lenders, including Quicken, have signed on to the two-year pilot program, said Secretary of Housing and Urban Development Shaun Donovan…Donovan said he expects the loans will serve about 30,000 homeowners and will not only save them money on energy bills but also reduce pollution and create at least 3,000 construction jobs." 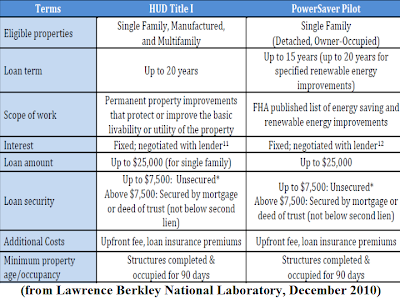 "The loans are part of the Obama administration’s broader efforts to improve home energy efficiency…In November, Vice President Biden announced a pilot program to test a new Home Energy Score [similar to the miles-per-gallon label for cars], which ranks a home’s energy efficiency on a scale of 1 to 10…[It] will tell consumers how their homes compare with others and how much money they could save with efficiency upgrades based on an energy audit…"
"Donovan said the Home Energy Score could help prove the payback for various upgrades,and the PowerSaver loans could expand demand for them that will prompt greater private investment…The Federal Housing Administration will cover up to 90% of the loans’ amount in the case of default, leaving the remaining risk to the lenders..."
"…[The ACI 2011 Sustainability Report] summarizes data on greenhouse gas emissions (GHG), energy use, water use and solid waste associated with U.S. production of cleaning products." "… Water use decreased approximately 10% per unit of production between 2007 and 2009…[and, 4] Waste generation per unit of production decreased between 2008 and 2009, but increased by approximately 2% overall between 2007 and 2009…[due] largely to an increase in waste by a company whose overall waste generation is an order of magnitude higher than the other[s]…"
"Under ACI’s Principles for Sustainability, a sustainability definition is laid out for the cleaning products industry: The ability to improve the quality of life for this and future generations, by creating products that promote hygiene and cleanliness, are environmentally sound, and are economically successful…"
It is entirely laughable the way wind’s ignorant enemies try to use favorable facts about it to criticize it. They are obviously jealous. The widely known example is birds. 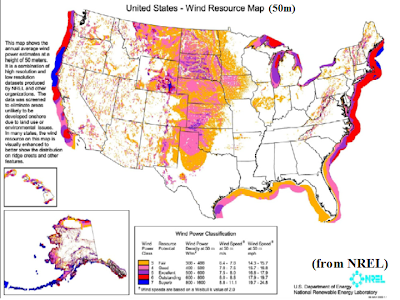 After an accidentally very bad start in the early 1980s, the wind industry has done more than most types of infrastructure to accommodate avian life and habitat. Whereas glass windows, tall buildings, transmission wires and house cats are all brutal to birds, wind turbines cause a tiny, tiny percentage – perhaps one-half of one percent – of bird incidents. 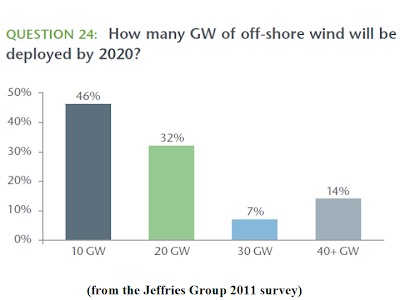 Yet wind's enemies have created the impression in the public's mind that wind turbines are a terrible threat. The worst human-made threat birds face is global climate change and wind is an answer to that. Capacity factor is also misrepresented. 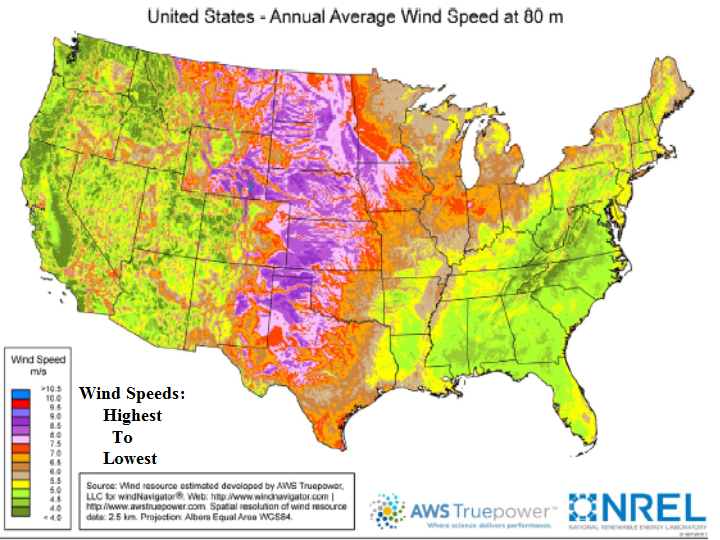 Wind’s jealous critics use it to claim that because it is not always present, it is not ready to be a part of the U.S. power supply. Capacity factor is a statistical evaluation made of every type of power generation. It compares online time to offline time. Nuclear plants have the highest capacity factor, around 70 percent. In fact, the trouble with nuclear is that it is hard to turn off, as the Japanese have recently so painfully discovered. A coal plant’s capacity factor ranges from 55 to 70 percent. Wind’s capacity factor is 30 percent. Natural gas plants, the only type of power generation currently being built more than wind, have a capacity factor of 8 to 10 percent. 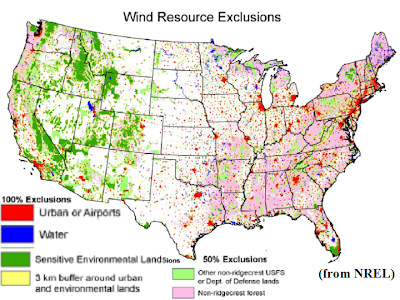 Wind’s enemies take advantage of the common knowledge that in any given location the wind is not blowing 100 percent of the time to suggest it is therefore unreliable. The supposed verification is its acknowledged 30 percent capacity factor. Each power source has strengths and weaknesses. Nuclear is like somebody who is charismatic but unreliable. It generates powerfully but trips offline unpredictably and all at once. It also can’t be controlled so cannot match rising and falling consumer demand. Coal goes up and down painfully slowly and throws off dreadful emissions, like a lazy person with a bad smell. Gas prices are unpredictable but it can easily be matched with demand (like somebody genial but frivolous). Geothermal energy may have the best combination of capacity factor and price but isn’t yet widely available, like someone too flirtatious to count on. Wind (and sun) are free and predictably available, though not everywhere, all the time. 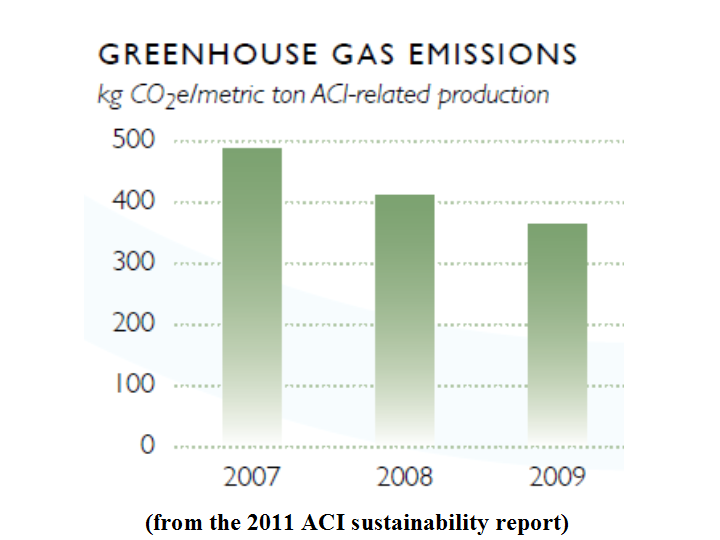 They are known, predictable, supportive of a sustainable way of life (and ready to love 8-). The obvious solution is a system that incorporates the best of all sources while reducing the downside burden of each. That would require two fundamental advances in supplying electricity, both of which are being aggressively developed by transmission system operators across the U.S. and around the world. The first is a high voltage grid that can deliver large supplies of resources from remote locations to highly populated demand centers. The second is a smart grid that can manage supplies of every type, capacity factor, cost and availability without causing a flicker of a light bulb. 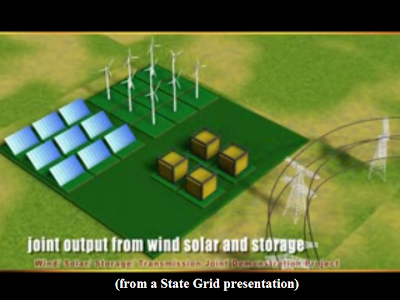 With such a grid, wind and sun and geothermal can be harvested wherever they are, gas can be used to supplement where it is needed and coal and nuclear can finally be acknowledged as problematic and gradually phased out. The basic idea: Go out and dance with everybody at the club, the charasmatic Romeos and charming lonely oldsters and wild youngsters, but go home with New Energy. The study highlighted below reports on new wind measurements for breakthrough, taller turbines now (or soon to be) in use. 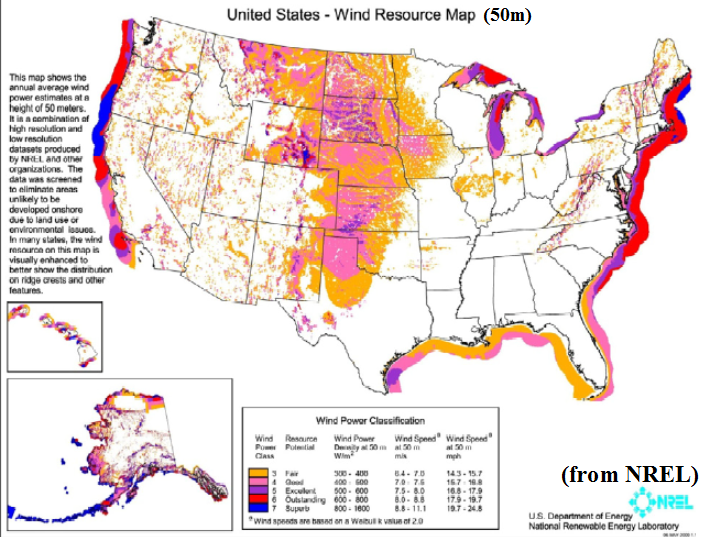 The conclusion: In the best locations, wind’s potential is “enormous.” 10,500 gigawatts at 80 meters, 12,000 gigawatts at 100 meters. More than 35 states have more than 1,000 megawatts of capacity at 80 meters and more than 38 states have that at 100 meters. 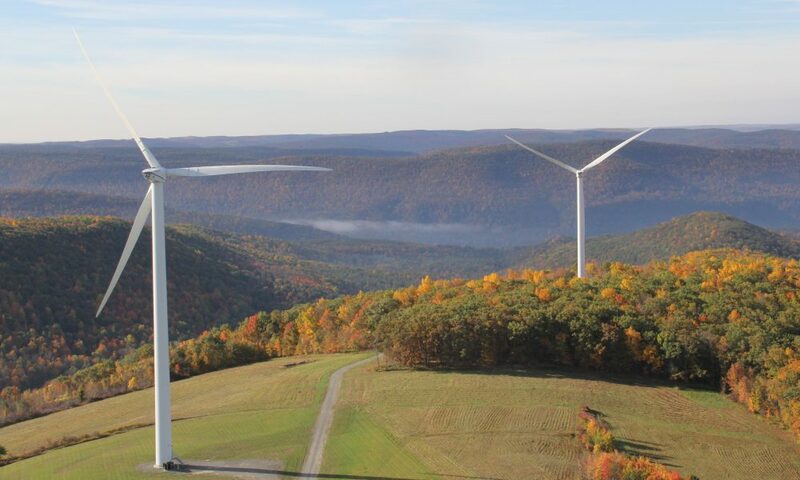 The study’s conclusions come even without factoring in new developments in blade and mechanical technologies that make a turbine able to harvest even the mildest of breezes. 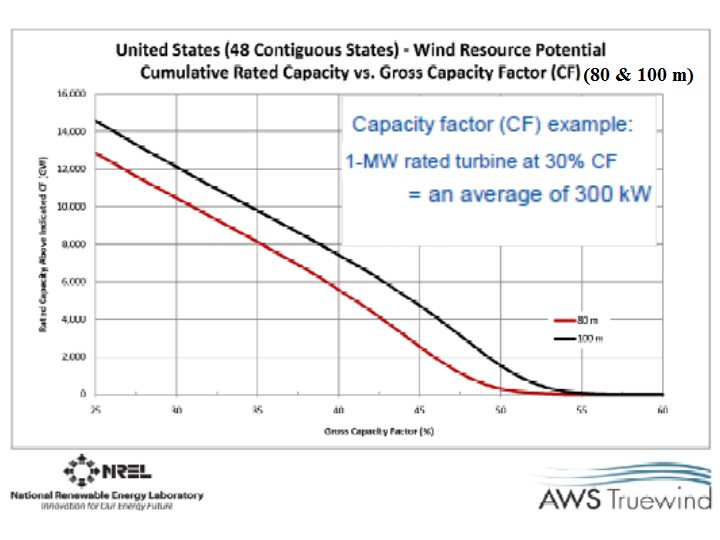 Yet wind’s enemies focus on this concept of capacity factor, claiming a turbine’s stated nameplate capacity is somehow a public deception or a scam. Balderdash. The same critics would not say that a 400 megawatt gas plant is really only 40 megawatts because its capacity factor is 10 percent. This is called grandstanding because it is convincing to the uninformed. 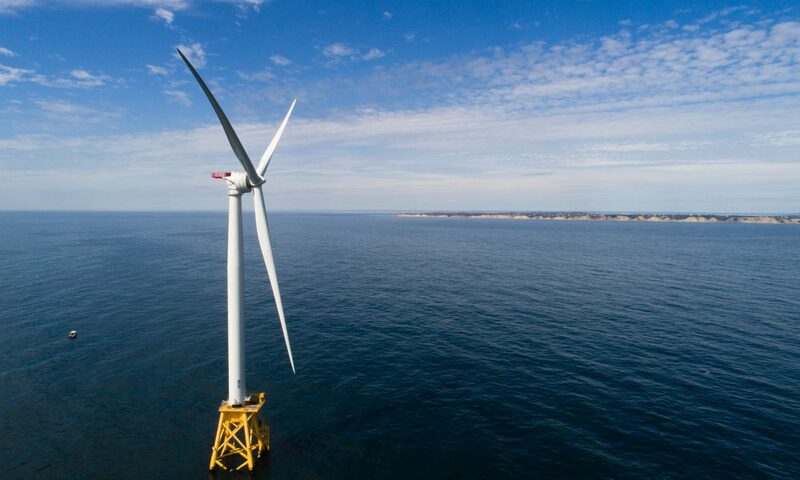 But it is not a criticism that influences investors who, over the last five years, have chosen wind to be 35 percent of new U.S. generation, second only to natural gas. 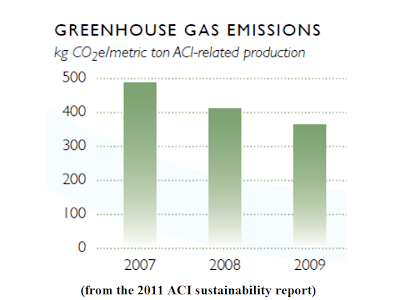 No new coal plants have broken ground since 2008. No new nuclear plants have been built in decades. Oddly, the more wind’s enemies talk, the better things get for wind. Shows the quality of the opposition. But nevermind the naysayers - wind is ready. 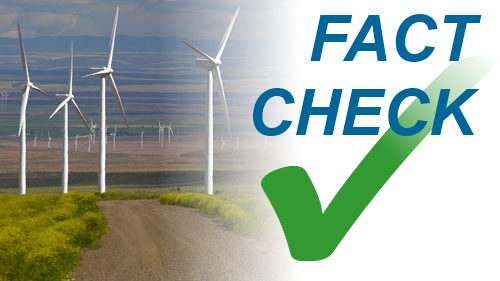 Supports the Program’s mission of eliminating barriers to wind energy. 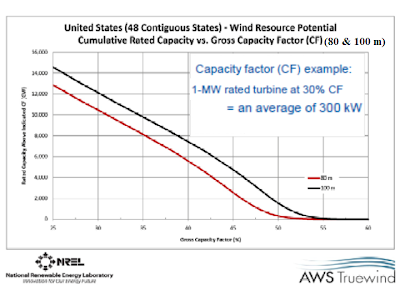 Why use CF and not Power Class to produce wind potential estimates?CF is representative of power output from large wind turbines.Power classis representative of theoretical energy in the wind. "… Approximately two-thirds of investors surveyed believe that a full recovery of the IPO market for clean technology companies is likely to occur by the first half of 2012…"
"… [T]he most attractive investment themes, in order of importance, [were identified as] smart grid / energy efficiency, solar photovoltaics, energy storage, LED / lighting and electric vehicles…"
"… North America, Europe and China together are expected to lead the deployment of smart grid infrastructure, a finding that is in slight contrast to…[the] November 2010 [survey], which found that Europe and North America would likely lead…"
"As the world's largest fossil fuel consumer, China is trying to use more clean energy, but…[its] current electric grid can't handle it…State Grid Corp. of China, the country's top electricity distributor…[is therefore] building what it calls a "strong, smart grid." After two years of testing…[it is] now throttling up to full-speed implementation. "The [hopes are] to rescue renewable energy, especially wind power, from a technical bottleneck…create demand that could give China a better position in the lucrative and highly competitive global smart grid component manufacturing race…[and] reduce the nation's transportation emissions by developing a nationwide electric vehicle charging network…"
"For the sake of its environment and energy security, China in recent years has been trying to add renewable energy into its power mix, but the country's strongest winds, brightest sunlight and most powerful rivers aren't found near the nation's energy-hungry regions…And [those connected] often have to be shut down when wind is at its peak because the existing grid is too weak…In the first half of 2010 alone, wind-generated electricity that could have been used by about 10 million Chinese for a whole year had nowhere to go…"
"In addition, technology innovation is under way to make the grid smarter…[and] grid development is also expected to forge Chinese manufacturing power…China's wind turbine industry -- which barely existed in 2004 -- now holds four seats among the world's top 10 manufacturers…[Finally,] over the next five years, hundreds of thousands of electric vehicles charging points will be added as part of the grid plan…[T]hat will encourage Chinese automakers to produce electric cars and pave the way for drivers who want to switch…"
"…[A] dedicated 240-volt outlet, similar to those that power an electric dryer [rather than a standard 120-volt outlet], can cut charging time in half…Two mass-market electric cars, the Chevrolet Volt and the Nissan Leaf, have different power systems and different charging needs…"
"…It takes eight hours to recharge [the all-electric] Leaf even with a 240-volt circuit, double that at 120 volts. The Volt has a small gas motor…[for when] the battery runs out. Its smaller battery pack can be recharged in 10 hours even on 120 volts, five hours or less at 240. "AeroVironment, which makes charging stations for Nissan, recommends…a special 240-volt station...[installed by] an electrician who knows about car charging…[It] costs about $2,000 for the dock and standard electrical installation services through AeroVironment and a Nissan dealership…"
"…If you go only 20 miles a day, a 120-volt outlet will work for either car because the battery doesn't have to be fully charged every night…"
"A NextEra Energy Inc unit will sell 100.8 megawatts (MW) of wind energy to Google Inc's energy subsidiary…[to] help the Internet search giant power its data centers using renewable sources of energy…[T]o reduce its carbon footprint, Google has been buying renewable electricity… on the same grid[s]…as its [data] centers. 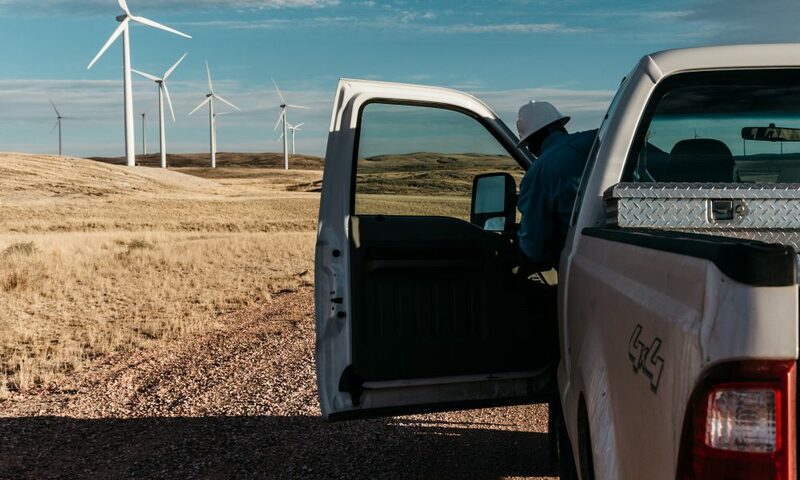 "Last year, the company's energy unit…Google Energy…[signed a 20-year power purchase agreement for 114 MW of NextEra wind and]…will now purchase power from NextEra Energy Resources' Minco II Wind Energy Center in Oklahoma. The electricity from their prior deal will be used at Google's Council Bluffs, Iowa center." 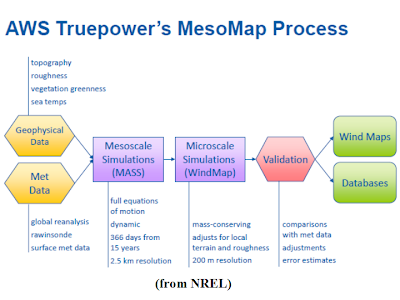 "…[The] Mayes County, Oklahoma center…is expected to be fully operational by the end of this year and could employ about 100 people…NextEra expects the Minco project to be operational by the end of 2011. "Google [also recently] partnered with units of Japan's Sumitomo Corp and Itochu Corp for a stake in General Electric Co's under-construction wind farm in Oregon for $500 million…NextEra is one of the largest wind power producers in North America, running more than 9,500 wind turbines at 85 farms in 17 U.S. states and in Canada. 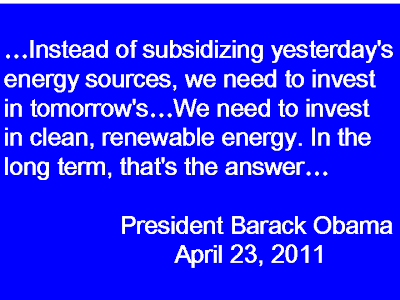 Its wind farms can power more than 2 million average homes…"
One sure thing about solar energy: It’s too expensive. Except that, as Mark Twain famously observed, “it's what you know for sure that just ain’t so” that causes the most trouble. In real life, there is always more to know. That’s the challenge and the beauty. 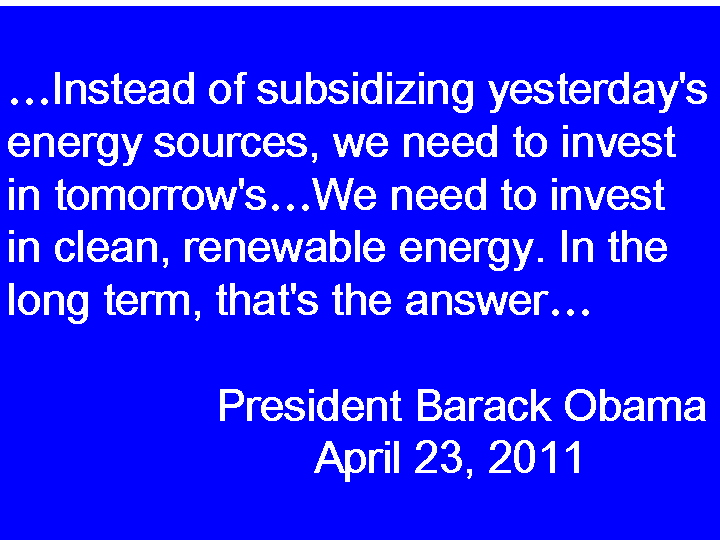 There is harsh opposition to the New Energies from some U.S. political leaders. 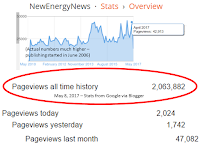 Grossly inaccurate anti-New Energy arguments from the fossil fuel industries have long been accepted by their allies in politics and the media and are hard to discredit. Opinion-makers who believe such inaccuracies and half-truths are responding to propaganda designed to protect vested interests. It can only be fought, tirelessly, with the truth. Many who understand the New Energies and all the good they offer continue to fight like demons. They fight to make the truth known because much opposition to New Energy comes from a simple a lack of knowledge, especially in a wider public that is otherwise intuitively inclined toward the blessings of this good earth’s sun, wind, deep heat and flowing waters. 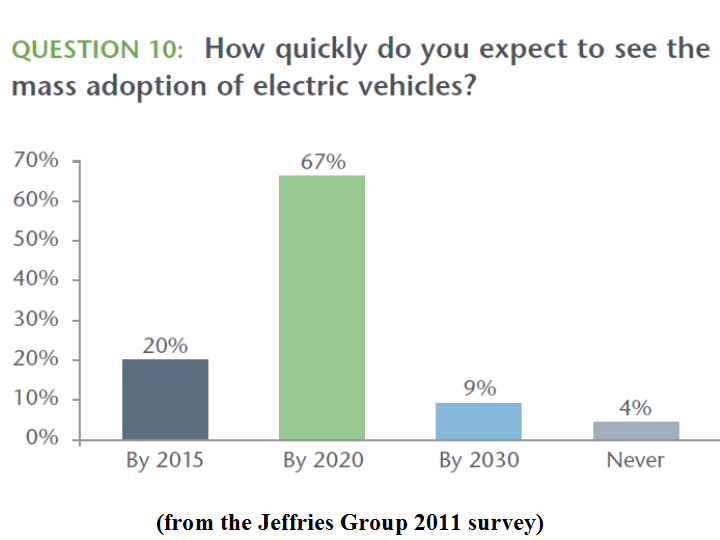 That public’s intuitions can be challenged because it hasn’t yet taken the time to get to know New Energy better. As a result, the half-truths of entrenched interests sway it. Though the urgencies of a needy economy, rising energy prices and a changing climate all press in, knowing takes time. Inevitably, the undeniable logic of New Energy will make it easy for the public to embrace what every poll shows it already sees with its heart. Case in point: As the new study highlighted below concludes, the question of New Energy’s cost is not as simple as the Old Energy propagandists contend. Robert Bryce, one of the most outspoken oil and gas industry spokespersons, frequently concludes his diatribes with the condescending observation that though solar is great and he has panels on his own home, it is too costly. This argument that solar is not ready to be a part of the nation’s energy mix because it is too expensive fails to recognize the calculation’s many dimensions. 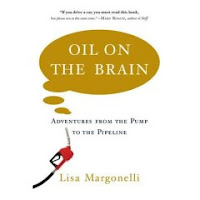 Set aside the enormous cost burdens of oil spills that kill and create ecological disasters and nuclear meltdowns that devastate and create environmental catastrophes. The study below shows that Bryce will – when he sells his house – likely discover he is completely wrong about the cost of solar. Bryce will get back the expense of having installed the solar panels in the house’s resale price – after benefiting from all the free electricity they generated while he owned them. 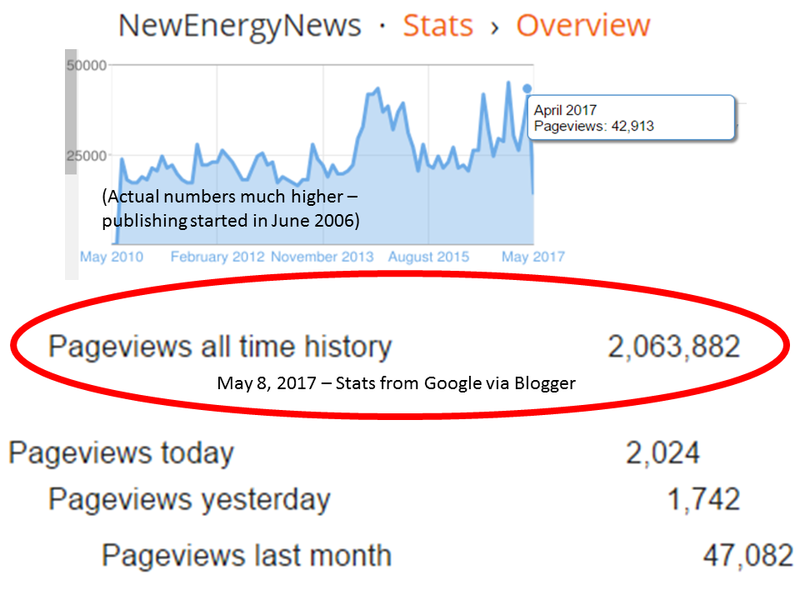 But, having had this personal experience of getting to know New Energy, will Bryce be able to adjust his understanding and embrace solar? As President Obama’s ardent believers have discovered in the last two years, change does not come easy. If Bryce is as fair-minded as he claims to be, he will have to reconsider his position about solar. If he continues to spout fossil fuel industry half-truths, he will reveal himself as their tool. The facts are the facts. 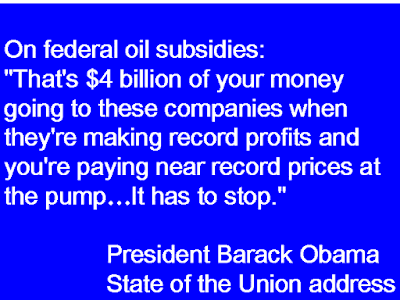 The fossil fuels' self-protective yammering cannot indefinitely deceive this great nation’s sensible citizens. Sooner or later, they will trust what they see with their own eyes and they will – from personal experiences – come to know and embrace New Energy. An increasing number of homes with existing photovoltaic (PV) energy systems have sold in the U.S., yet relatively little research exists that estimates the marginal impacts of those PV systems on home sales prices. A clearer understanding of these effects might influence the decisions of homeowners considering installing PV on their home or selling their home with PV already installed, of home buyers considering purchasing a home with PV already installed, and of new home builders considering installing PV on their production homes. 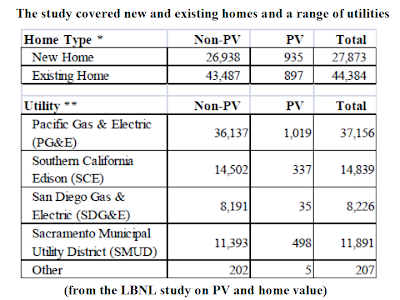 This research analyzes a large dataset of California homes that sold from 2000 through mid-2009 with PV installed. 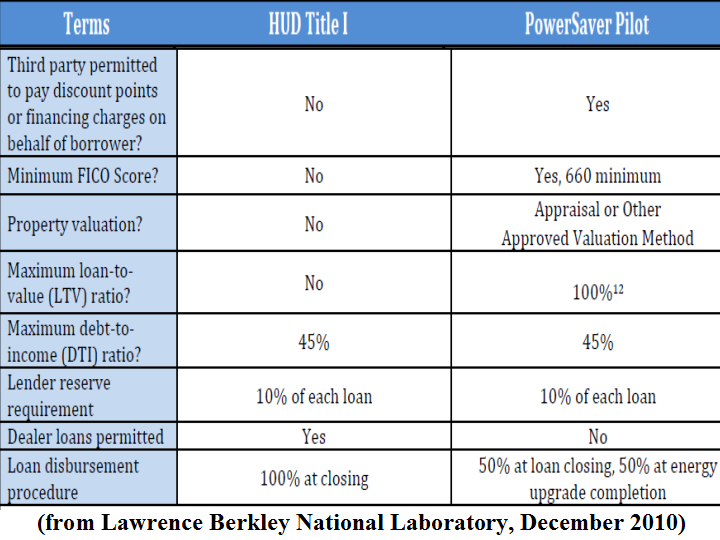 Across a large number of hedonic and repeat sales model specifications and robustness tests, the analysis finds strong evidence that California homes with PV systems have sold for a premium over comparable homes without PV systems. The effects range, on average, from approximately $3.9 to $6.4 per installed watt (DC) of PV, with most coalescing near $5.5/watt, which corresponds to a home sales price premium of approximately $17,000 for a relatively new 3,100 watt PV system (the average size of PV systems in the study). 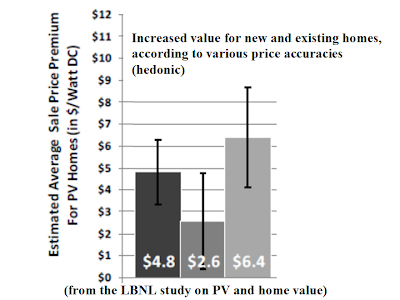 These average sales price premiums appear to be comparable to the investment that homeowners have made to install PV systems in California, which from 2001 through 2009 averaged approximately $5/watt (DC), and homeowners with PV also benefit from electricity cost savings after PV system installation and prior to home sale. 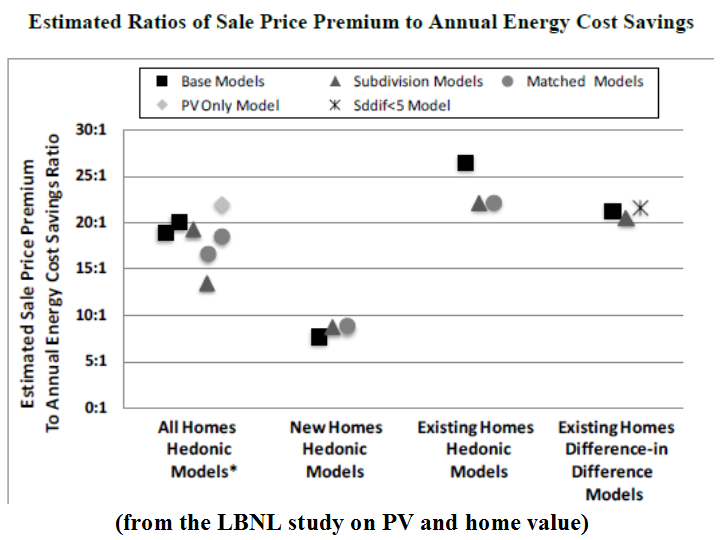 When expressed as a ratio of the sales price premium to estimated annual electricity cost savings associated with PV, an average ratio of 14:1 to 22:1 can be calculated; these results are consistent with those of the more-extensive existing literature on the impact of energy efficiency (and energy cost savings more generally) on home sales prices. The analysis also finds - as expected - that sales price premiums decline as PV systems age. Additionally, when the data are split between new and existing homes, a large disparity in premiums is discovered: the research finds that new homes with PV in California have demonstrated average premiums of $2.3-2.6/watt, while the average premium for existing homes with PV has been more than $6/watt. 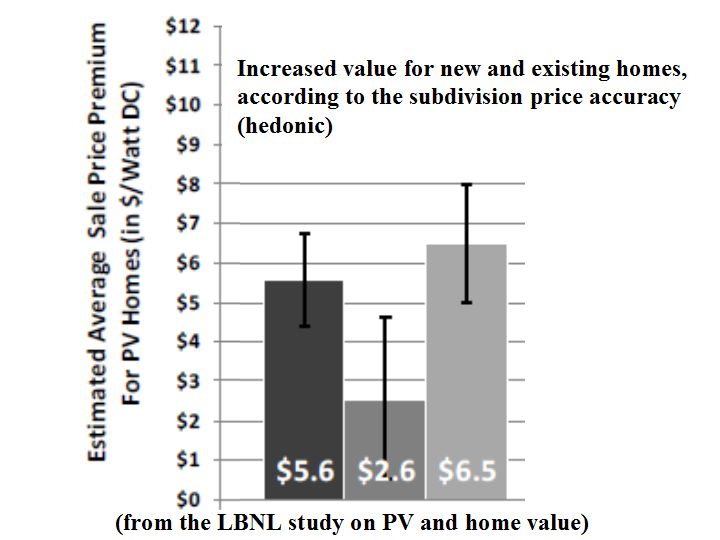 One of several possible reasons for the lower premium for new homes is that new home builders may also gain value from PV as a market differentiator, and have therefore often tended to sell PV as a standard (as opposed to an optional) product on their homes and perhaps been willing to accept a lower premium in return for faster sales velocity. Further research is warranted in this area, as well as a number of other areas that are highlighted. In calendar year 2010, approximately 880 megawatts (MW)1 of grid-connected solar photovoltaic (PV) energy systems were installed in the U.S. (of which approximately 30% were residential), up from 435 MW installed in 2009, yielding a cumulative total of 2,100 MW (SEIA & GTM, 2011). California has been and continues to be the country’s largest market for PV, with nearly 1000 MW of cumulative capacity. California is also approaching 100,000 individual PV systems installed, more than 90% of which are residential. An increasing number of these homes with PV have sold, yet to date, relatively little research has been conducted to estimate the existence and level of any premium to sales prices that the PV systems may have generated. One of the primary incentives for homeowners to install a PV system on their home, or for home buyers to purchase a home with a PV system already installed, is to reduce their electricity bills. However, homeowners cannot always predict if they will own their home for enough time to fully recoup their PV system investment through electricity bill savings. The decision to install a PV system or purchase a home with a PV system already installed may therefore be predicated, at least in part, on the assumption that a portion of any incremental investment in PV will be returned at the time of the home’s subsequent sale through a higher sales price. Some in the solar industry have recognized this potential premium to home sales prices, and, in the absence of having solid research on PV premiums, have used related literature on the impact of energy efficiency investments and energy bill savings on home prices as a proxy for making the claim that residential PV systems can increase sales prices (e.g., Black, 2010). The basis for making the claim that an installed PV system may produce higher residential selling prices is grounded in the theory that a reduction in the carrying cost of a home will translate, ceteris paribus, into the willingness of a buyer to pay more for that home. Underlying this notion is effectively a present value calculation of a stream of savings associated with the reduced electricity bills of PV homes, which can be capitalized into the value of the home. Along these lines, a number of studies have shown that residential selling prices are positively correlated with lower energy bills, most often attributed to energy related home improvements, such as energy efficiency investments (Johnson and Kaserman, 1983; Longstreth et al., 1984; Laquatra, 1986; Dinan and Miranowski, 1989; Horowitz and Haeri, 1990; Nevin and Watson, 1998; Nevin et al., 1999). The increased residential sales prices associated with lower energy bills and energy efficiency measures might be expected to apply to PV as well. Some homeowners have stated as much in surveys (e.g., CEC, 2002; McCabe and Merry, 2010), though the empirical evidence supporting such claims is limited in scope. Farhar et al. (2004a; 2008) tracked repeat sales of 15 “high performance” energy efficient homes with PV installed from one subdivision in San Diego and found evidence of higher appreciation rates, using simple averages, for these homes over comparable homes (n=12). More recently, Dastrop et al. (2010) used a hedonic analysis to investigate the selling prices of 279 homes with PV installed in the San Diego, California metropolitan area, finding clear evidence of PV premiums that averaged approximately 3% of the total sales price of non-PV homes, which translates into $4.4 per installed PV watt (DC). In addition to energy savings, higher selling prices might be correlated with a “cachet value” based on the “green” attributes that come bundled with energy-related improvements (e.g., helping combat global warming, impressing the neighbors, etc.). A number of recent papers have investigated this correlation. Eichholtz et al. 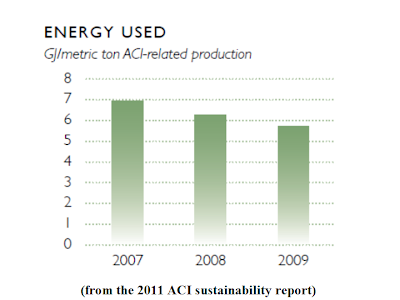 (2009, 2011) analyzed commercial green properties in the U.S, and Brounen and Kok (2010) and Griffin et al. (2009) analyzed green labeled homes in the Netherlands and Portland, Oregon, respectively, each finding premiums, which, in some cases, exceeded the energy savings (Eichholtz et al., 2009, 2011; Brounen and Kok, 2010). Specifically related to PV, Dastrop et al. (2010) found higher premiums in communities with a greater share of Toyota Prius owners and college grads, indicating, potentially, the presence of a cachet value to the systems over and above energy savings. It is therefore reasonable to believe that buyers of PV homes might price both the energy savings and the green cachet into their purchase decisions. Of course there is both a buyer and a seller in any transaction, and the sellers of PV homes might be driven by different motivations than the buyers. Specifically, recouping the net installed cost of the PV system (i.e., the cost of PV installation after deducting any available state and federal incentives) might be one driver for sellers. In California, the average net installed cost of residential PV hovered near $5/watt (DC) from 2001 through 2009 (Barbose et al., 2010). Adding slightly to the complexity, the average net installed cost of PV systems has varied to some degree by the type of home, with PV systems installed on new homes in California enjoying approximately a $1/watt lower average installed cost than PV systems installed on existing homes in retrofit applications (Barbose et al., 2010). Further, sellers of new homes with PV (i.e., new home developers) might be reluctant to aggressively increase home sale prices for installed PV systems because of the burgeoning state of the market for PV homes and concern that more aggressive pricing might slow home sales, especially if PV is offered as a standard (not optional) product feature (Farhar and Coburn, 2006). At the same time, the possible positive impact of PV on product differentiation and sales velocity may make new home developers willing to sell PV at below the net installed cost of the system. After all, some studies that have investigated whether homes with PV (often coupled with energy efficient features) sell faster than comparable homes without PV have found evidence of increased velocity due to product differentiation (Dakin et al., 2008; SunPower, 2008). 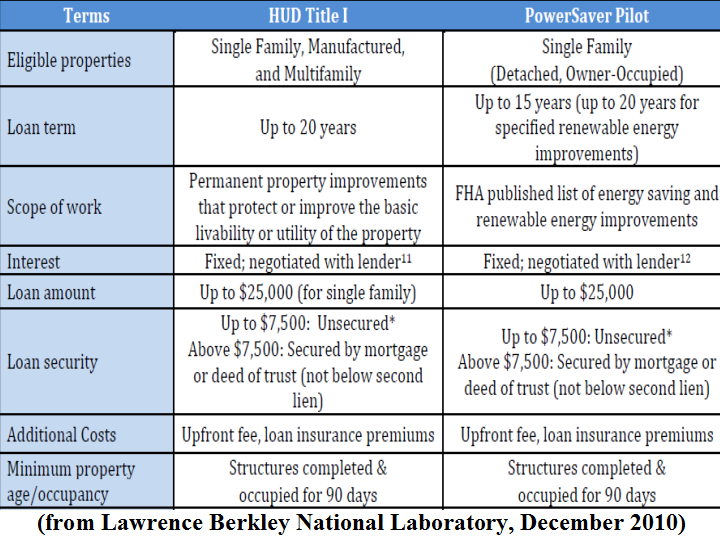 Finally, as PV systems age, and sellers (i.e., homeowners) recoup a portion of their initial investment in the form of energy bill savings (and, related, the PV system’s lifespan decreases), the need (and ability) to recoup the full initial investment at the time of home sale might decrease. 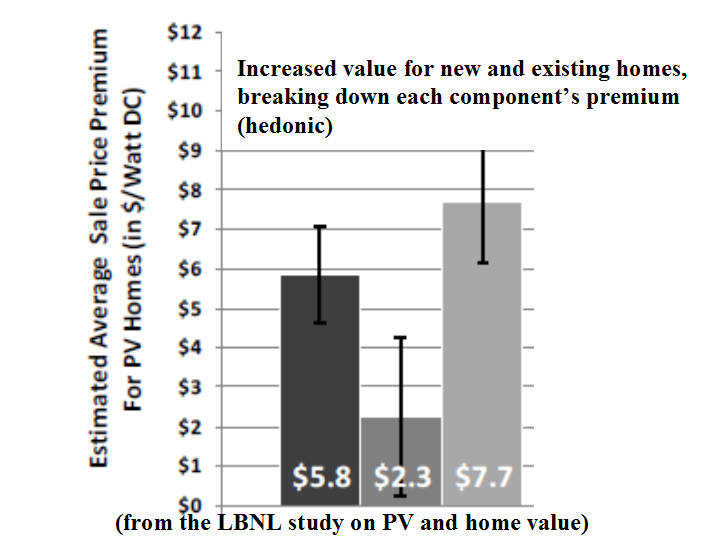 On net, it stands to reason that premiums for PV on new homes might be lower than those for existing homes, and that older PV systems might garner lower premiums than newer PV systems of the same size. Though a link between selling prices and some combination of energy cost savings, green cachet, recouping the net installed cost of PV, seller attributes, and PV system age likely exists, the existing empirical literature in this area, as discussed earlier, has largely focused on either energy efficiency in residential and commercial settings, or PV in residential settings but in a limited geographic area (San Diego), with relatively small sample sizes. Therefore, to date, establishing a reliable estimate for the PV premiums that may exist across a wide market of homes has not been possible. Moreover, establishing premiums for new versus existing homes with PV has not yet been addressed. Additionally, research has not investigated whether there are increasing or decreasing returns on larger PV systems, and/or larger homes with the same sized PV systems, nor has research been conducted that investigates whether older PV systems garner lower premiums. 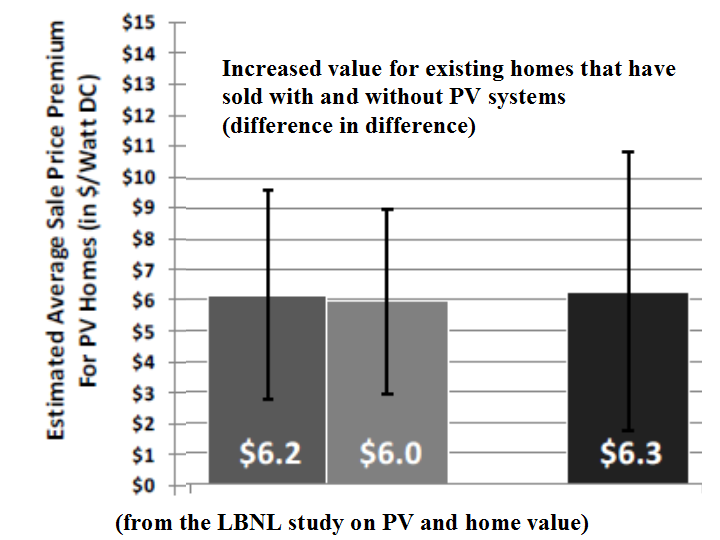 In the case of returns to scale on larger PV systems, it is not unreasonable to expect that any increase in value for PV homes may be non-linear as it relates to PV system size. For example, if larger PV systems push residents into lower electricity price tiers2, energy bill savings could be diminished on the margin as PV system size increases. This, in turn, might translate into smaller percentage increases in residential selling prices as PV systems increase in size, and therefore a decreasing return to scale. 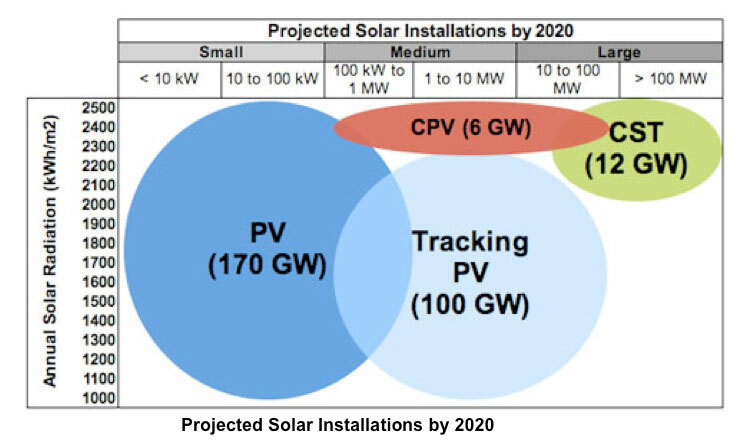 Larger PV systems might also enjoy some economies of scale in installation costs, which, in turn, might translate into lower marginal premiums at the time of home sale as systems increase in size – a decreasing return to scale. Additionally, “cachet value”, to the degree that it exists, is likely to be somewhat insensitive to system size, and therefore might act as an additional driver to decreasing returns to scale. Somewhat analogously, PV premiums may be related to the number of square feet of living area in the home. Potentially, as homes increase in size, energy use can also be expected to increase, leading homeowners to be subjected to higher priced electricity rate tiers and therefore greater energy bill savings for similarly sized PV systems. Finally, as discussed previously, as PV systems age, and both a portion of the initial investment is recouped and the expected life and operating efficiency of the systems decrease, home sales price premiums might be expected to decline. To explore these possible relationships, we investigate the residential selling prices across the state of California of approximately 2,000 homes with existing PV systems against a comparable set of approximately 70,000 non-PV homes. The sample is drawn from 31 California counties, with PV home sales transaction dates of 2000 through mid-2009. We apply a variety of hedonic pricing (and repeat sales) models and sample sets to test and bound the possible effects of PV on residential sales prices and to increase the confidence of the findings. Using these tools, we also explore whether the effects of PV systems on home prices are impacted by whether the home is new or existing, by the size of either the PV system or the home itself, and finally by how old the PV system is when the home sells. It should be stated that this research is not intended to disentangle the specific effects of energy savings, green cachet, recovery of the cost of installation, or seller motivations, but rather to establish credible estimates of aggregate PV residential sales price effects. The market for solar PV is expanding rapidly in the U.S. 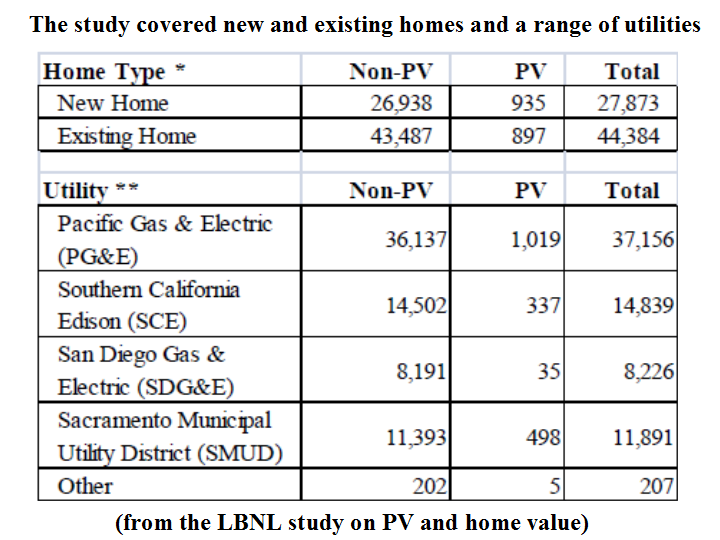 Almost 100,000 PV systems have been installed in California alone, more than 90% of which are residential. 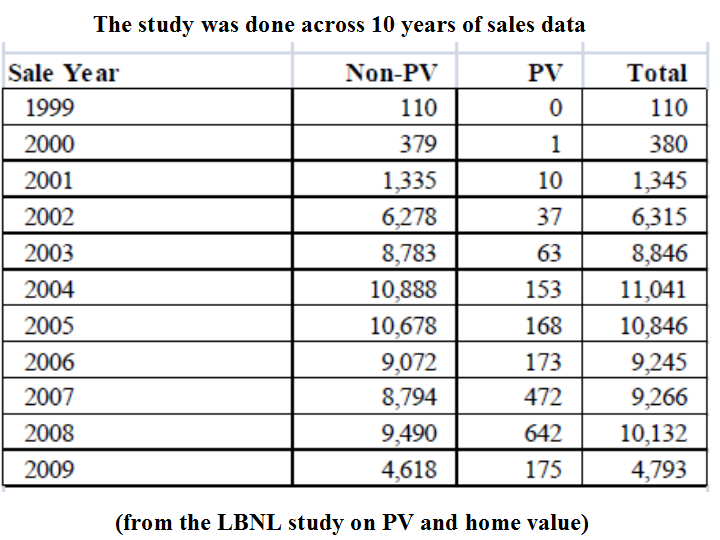 Some of those “PV homes” have sold, yet little research exists estimating if those homes sold for significantly more than similar non-PV homes. Therefore, one of the claimed incentives for solar homes - namely that a portion of the initial investment into a PV system will be recouped if the home is sold – has, to this point, been based on limited evidence. 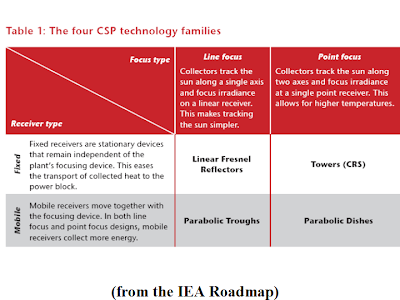 Practitioners have sometimes transferred the results from past research focused on energy efficiency and energy bills more generally and, while recent research has turned to PV that research has so far focused largely on smaller sets of PV homes concentrated in certain geographic areas. Moreover, the home sales price effect of PV on a new versus an existing home has not previously been the subject of research. 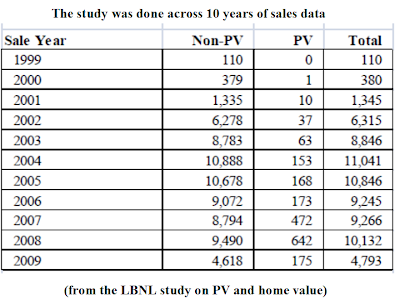 Similarly unexplored has been whether the relationship of PV system size to home sales prices is linear, and/or is affected by either the size of the home or the age of the PV system. 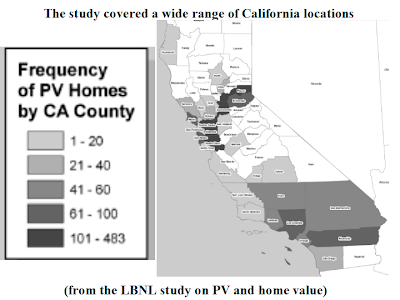 This research has used a dataset of approximately 72,000 California homes, approximately 2,000 of which had PV systems installed at the time of sale, and has estimated a variety of different hedonic and repeat sales models to directly address the questions outlined above. Moreover, an extensive set of robustness tests were incorporated into the analysis to test and bound the possible effects and increase the confidence of the findings by mitigating potential biases. 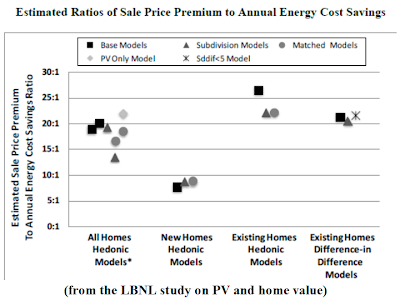 The research was not intended to disentangle the various individual underlying influences that might dictate the level of the home sales price premium caused by PV, such as, energy costs savings, the net (i.e., after applicable state and federal incentives) installed cost of the PV system, the possible presence of a green cachet, or seller attributes. Instead, the goal was to establish credible estimates for the aggregate PV residential sale price effect across a range of different circumstances (e.g., new vs. existing homes, PV system age). The research finds strong evidence that homes with PV systems in California have sold for a premium over comparable homes without PV systems. More specifically, estimates for average PV premiums range from approximately $3.9 to $6.4 per installed watt (DC) among a large number of different model specifications, with most models coalescing near $5.5/watt. That value corresponds to a premium of approximately $17,000 for a relatively new 3,100 watt PV system (the average size of PV systems in the study). 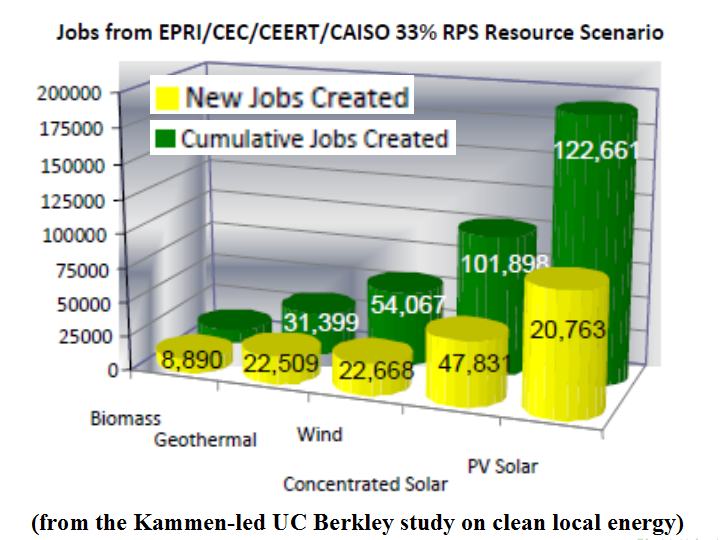 These results are similar to the average increase for PV homes found by Dastrop et al. (2010), which used similar methods but a different dataset, one that focused on homes in the San Diego metropolitan area. Moreover, these average sales price premiums appear to be comparable to the average net (i.e., after applicable state and federal incentives) installed cost of California residential PV systems from 2001-2009 (Barbose et al., 2010) of approximately $5/watt, and homeowners with PV also benefit from electricity cost savings after PV system installation and prior to home sale. 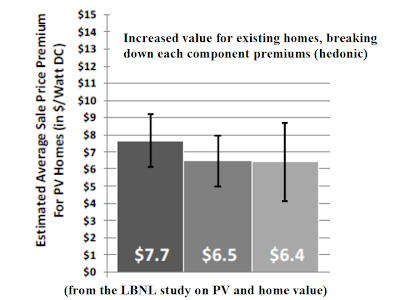 Although the results for the full dataset from the variety of models are quite similar, when the dataset is split among new and existing homes, PV system premiums are found to be markedly affected, with new homes demonstrating average premiums of $2.3-2.6/watt, while existing homes are found to have average premiums of $6-7.7/watt. 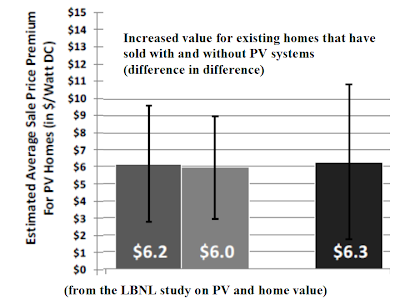 Possible reasons for this disparity between new and existing PV homes include: differences in underlying net installation costs for PV systems; a willingness among builders of new homes to accept a lower PV premium because PV systems provide other benefits to the builders in the form of product differentiation, leading to increased sales velocity and decreased carrying costs; and, lower familiarity and/or interest in marketing PV systems separately from the other features of new homes contrasted with a likely strong familiarity with the PV systems among existing home sellers. The research also investigated the impact of PV system age on the sales price premium for existing homes, finding - as would be expected - evidence that older PV systems are discounted in the marketplace as compared to newer PV systems. Finally, evidence of returns to scale for either larger PV systems or larger homes was investigated but not found. In addition to benchmarking the results of this research to the limited previous literature investigating the sales price premiums associated with PV, our results can also be compared to previous literature investigating premiums associated with energy efficiency (EE) or, more generally, energy cost savings. A number of those studies have converted this relationship into a ratio representing the relative size of the home sales price premium to the annual savings expected due to energy bill reductions. 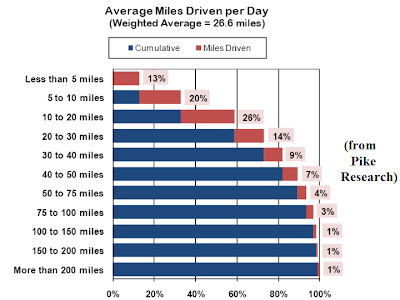 These ratios have ranged from approximately 7:1 (Longstreth et al., 1984; Horowitz and Haeri, 1990), to 12:1 (Dinan and Miranowski, 1989), to approximately 20:1 (Johnson and Kaserman, 1983; Nevin et al., 1999; Eichholtz et al., 2009), and even as high as 31:1 (Nevin and Watson, 1998). A $3.9 to $6.4/watt premium in selling price for an average California home with PV installed equates to a 14:1 to 22:1 sale price to energy savings ratio, respectively. For new homes, with a $2.3-2.6/watt sale price premium, this ratio is estimated to be 8:1 or 9:1, and for existing homes, with an overall sale price premium range of $6-7.6/watt, the ratio is estimated to range from 21:1 to 26:1. Without actual energy bill savings, these estimates are somewhat speculative, but nonetheless are broadly consistent with the previous research that has focused on EE-based home energy improvements.